Continuing on with our early testing on the carbon fiber options I foresaw for Menokin, I had to explain to Tim Macfarlane more about what I had done in the past regarding timber strengthening and share my sketches for what I thought would be practical and minimally-intrusive means of strengthening the types of deterioration found at Menokin. 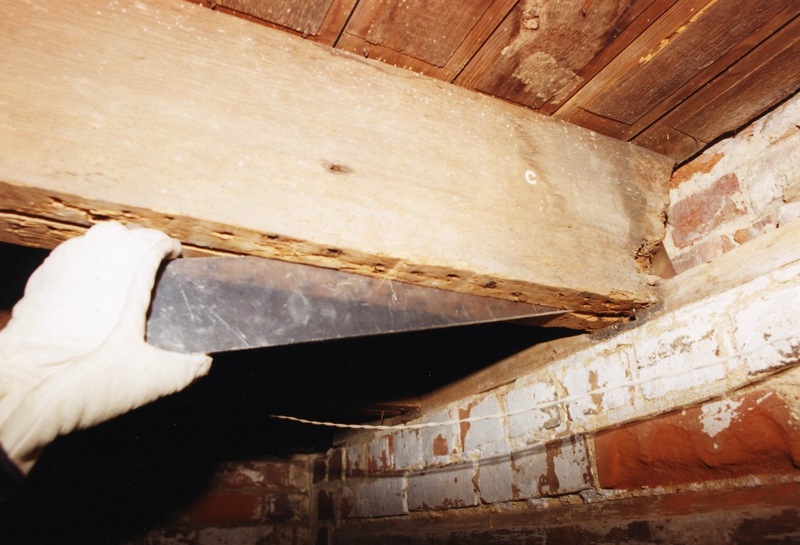 whereas the infill of beam intersections in the Rising Sun basement allowed large timbers to remain in place during repairs where the deterioration was isolated to a discreet area. But obviously Menokin’s large timbers were going to need a different approach. 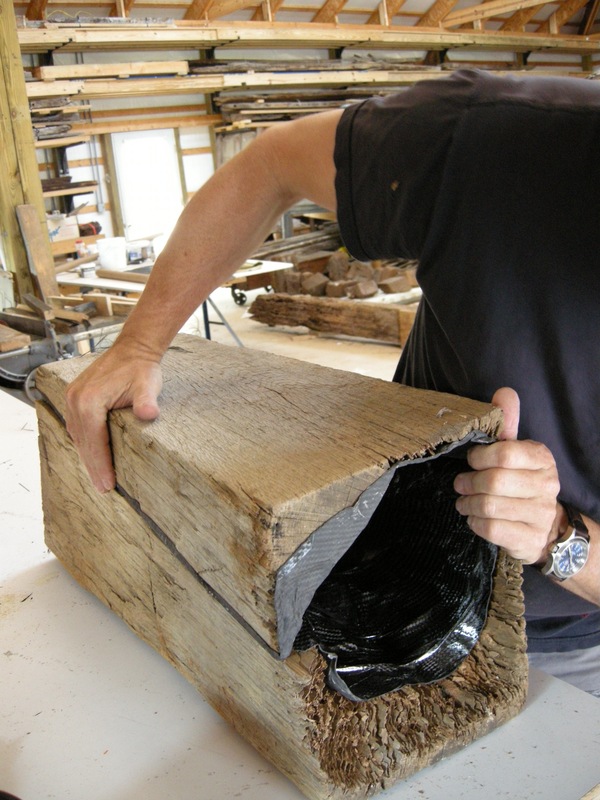 In preceding decades I had taken the remaining “veneer” of a timber –such as this corner brace from the Stratford Hall Smokehouse – and wrapped it around a new wood core so that exposed wooden members would appear unchanged. This works well in cases where there is limited load on the timber such as with the corner brace or with the basement window lintels at Londtontowne Public House where I could put additional hidden support above the visible timbers. But what options might we have to strengthen the center of timbers like the second floor joists at Menokin that would be visible from all sides and yet needed to be able to return to their functional loads in the building? Could we vacuum-bag a custom-fit carbon fiber beam in the center of the beams that would allow us to achieve all of these criteria? We did our mockup with a short section of non-Menokin timber. 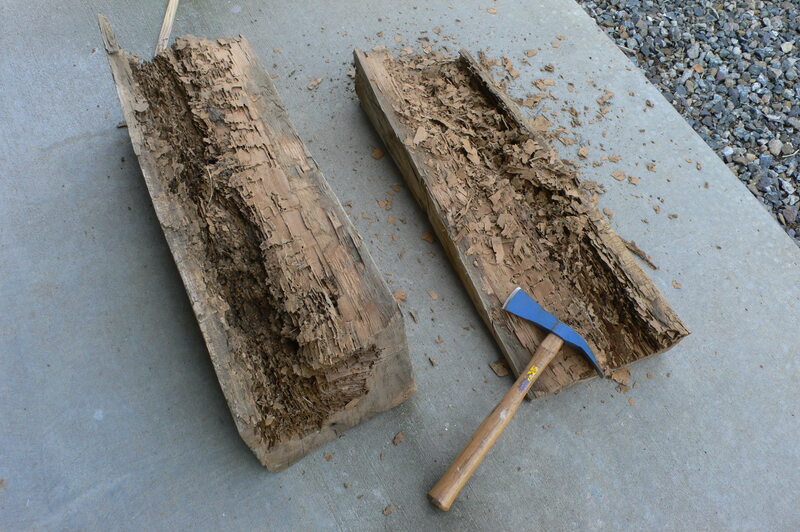 Split in half, we were able to dig out all of the termite frass back to sound wood. That left us with two halves that were relatively sound but left a large void at the center when the two portions were put back together. Into this center we would vacuum-bag carbon fiber cloth to each half. 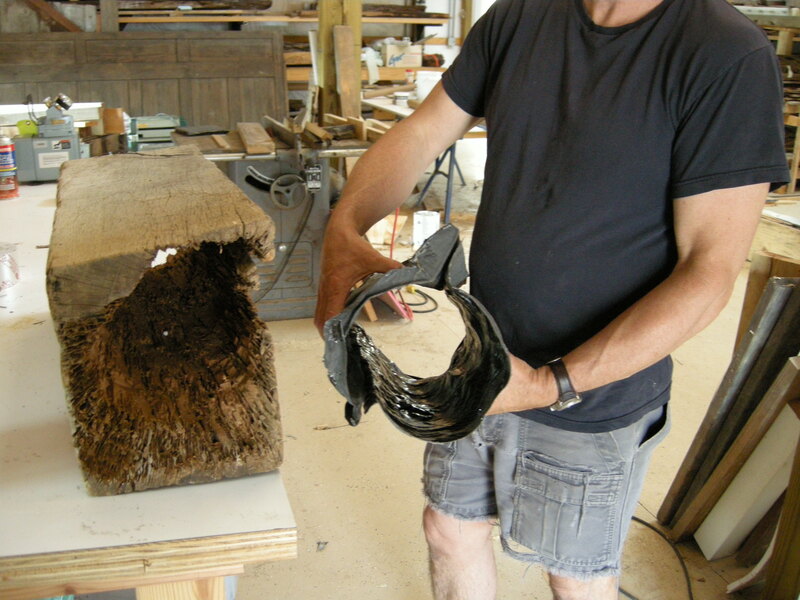 I covered this half of the hollowed beam section with plastic and laid in three layers of unidirectional CF cloth with the center layer oriented at 90-degrees to the other two layers, then constructed a vacuum bag for this timber, hooking it up to the pump. Of course we also had a release fabric in between. By the next day I was able to remove the beam from the bag and hand an absolutely tight-fitting stiff liner for the center of the beam. We were then able to pop the halves out. 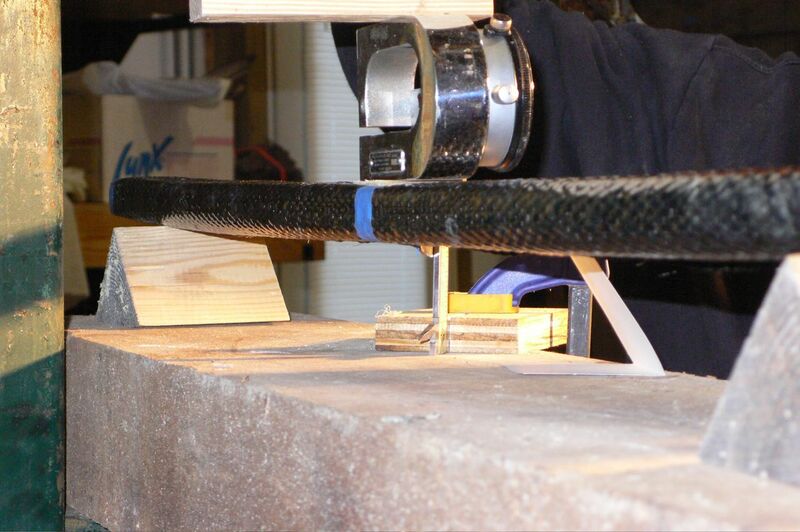 Here you can see how the two halves of carbon fiber meet and overlap at the joint to create a stiff beam. This hollow beam can be further stiffened by filling with foam. This way we gain tremendous strength without adding weight. The timber and its carbon fiber core assembled, leaving a nearly imperceptible repair from the top, bottom and sides of the timber’s length. 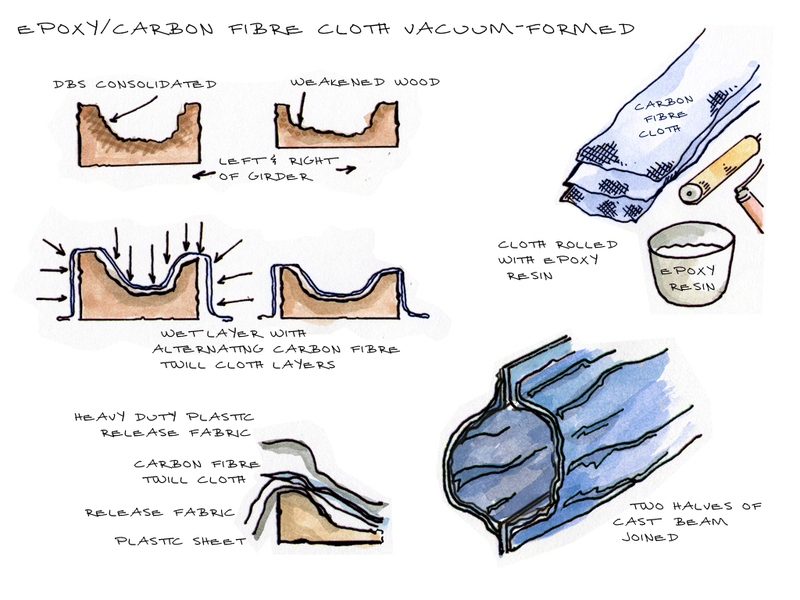 Finding data related to carbon fiber use for this type of use proved elusive, so we needed to gain relevant information about weaves from experience. We thus began a series of tests. The best information I found about the various weaves came from an unexpected source in the form of a textiles curator at the Cooper-Hewitt National Design Museum and her book “Extreme Textiles: Designing for High Performance” from 2005. Matilda McQuaid put very technical information into extremely clear layman’s terms. 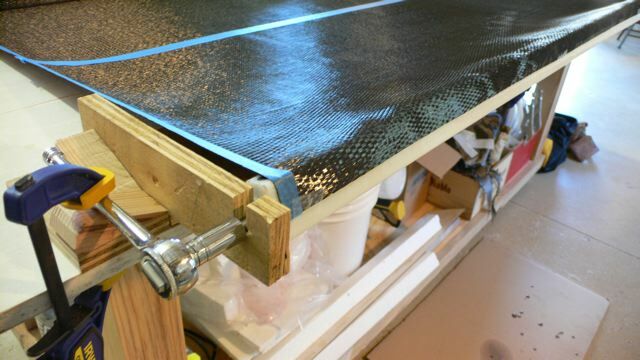 Wanting to learn more about the structural capacity of various weaves of cloth and with various fillers to the beam such as expanding foams, we created a series of consistent hollow beams with this simple rig that pulled the clothes through a bath of epoxy and screeded off any excess while making a taut tube. Here you can see the perfect hollow tubes that were created. 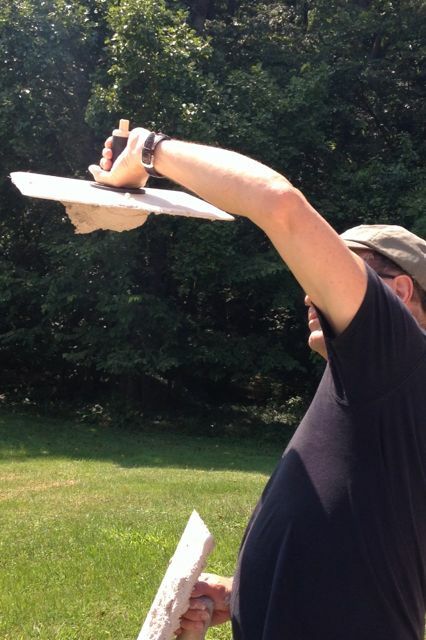 Then we loaded each style of beam to determine deflection coefficients and failure points, both hollow and filled. Finally, as we continue through these next few posts on carbon fiber repair options, it probably makes sense to discuss cost. Many may conclude that this is an expensive way to go about repairing a building – maybe even wasteful. My experience from the development of repairs that fit the artifact over the last four decades proves otherwise. 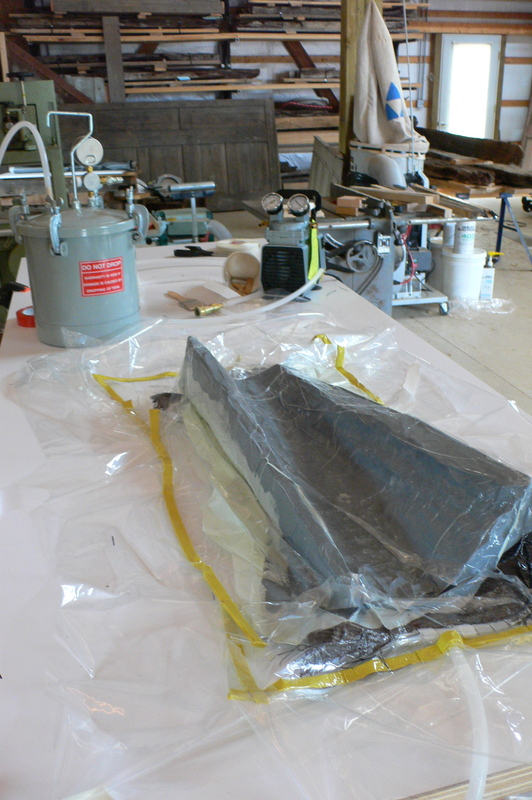 While the first few models of any new approach are expensive while the steps in the process are developed and refined, they provide new options in the conservator’s toolbox that quickly evolve to cheaper and faster repairs. Most importantly, these will be repairs that are better for the artifact because they fit to it, rather than cutting the artifact to make our repairs easy. By not compromising the original and by making the repairs reversible, the artifact can be left as the artifact. 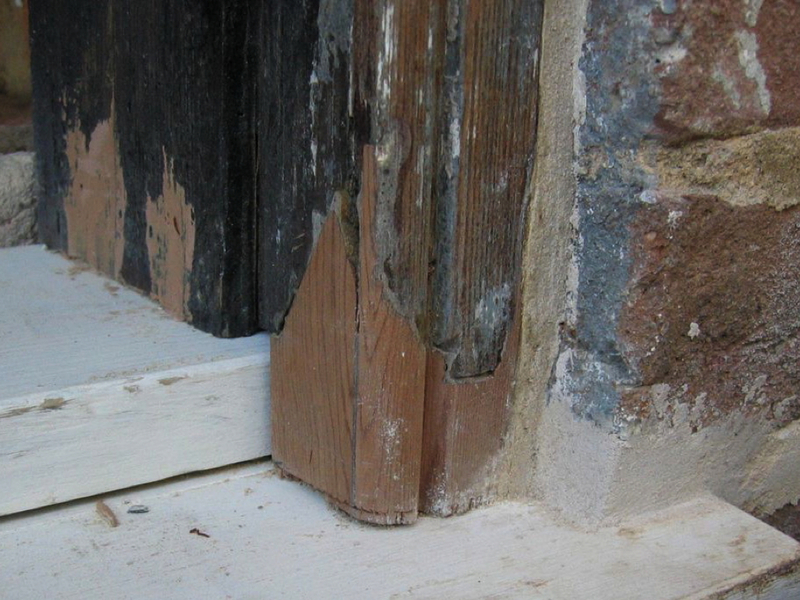 The following is our 2007 introduction to timber and masonry strengthening approaches we were investigating for the Menokin ruin in Warsaw, VA. At the time we were just completing the first phases of extraction and cataloguing of fallen elements from the basements. And we had just done an emergency stabilization to keep the one remaining relatively sound quadrant from buckling out into the field, so it was now even clearer how important it was to enclose the building to protect it from the elements. 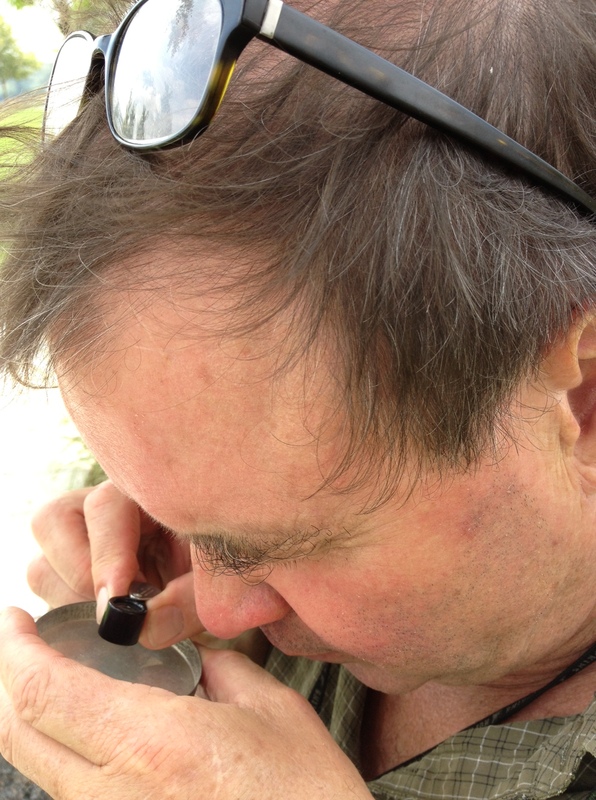 We had just made our pitch to renowned glass engineer Tim Macfarlane to join the team. He was immediately interested in working with us to design a means of enclosing the missing walls with glass. With this document, we were introducing him to the next stage in our thinking about the project which would include the glass and original walls providing the support for reintroduction of damaged timbers to their original location and function within the building. To do this, we needed to review the current state of timber conservation and explain how we were trying to take it to a new level for this project. “We have been working to stabilize the Northeast quadrant, mostly using temporary measures of wedges, grout, temporary windows to keep the weather out, and supports under beams and sagging plaster and lath. The second phase of repair that is about to begin will include structural repair to individual elements; realignment and reconnecting these elements to reestablish structural integrity of the girders, joists, studs and rafters. 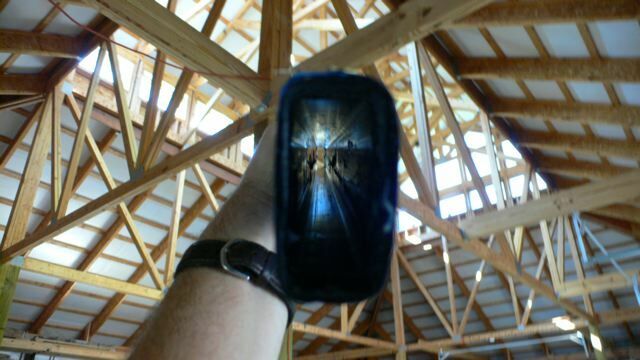 Charles and I have been developing and trying to improve techniques from one project to the next over the last thirty years across a variety of materials, including less-invasive repairs to structural timbers. I thought it might be useful for you if I gave a little retrospective and reflection on the evolution of the process over the last thirty years. The beginning of the “Preservation Movement” started from a pretty basic understanding of what would be involved in moving from a replace-in-kind restoration approach to one of trying to save original materials as valuable artifacts in their own right. The approach then and now too often was to tear the entire element out even though the damaged part may have represented a small percentage of the whole and replace it with “in-kind” materials. “In-kind” is just a good sounding phase that really means the architect is off the hook with the Secretary of the Interior’s Standards and the contractor can do whatever he thinks it means. But the result is always the same: more loss of the original artifact due to laziness and a general lack of respect/excitement when touching the real artifact. Under the best circumstances, repairs augment the original without destroying them. Much of this is basic stuff, for instance increasing strength (pull-apart) by using bolts, washers and nuts through an intersection; or nailing vertical pieces against a stud to increase the support to a joist or plate above; or sistering additional joists to existing ones to increase the stiffness to bending of the floor above; or metal plates nailed or riveted across joints, for instance the intersection of elements in a roof or bridge truss. 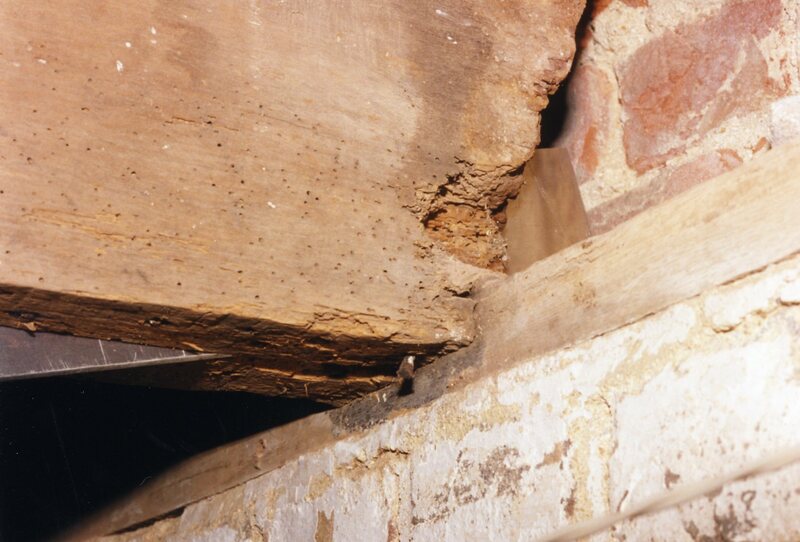 Then there were the less common dutchmen-type repairs to infill missing areas or extend a damaged part that connects to other elements like joist tenons that rest on a sill mortise. 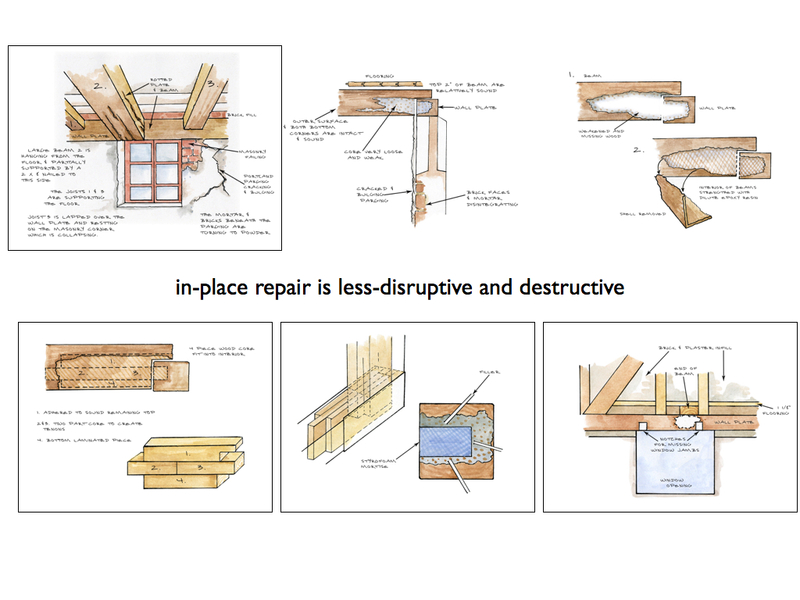 Repairs are supposed to be designed rationally (if not scientifically or mathematically) to determine the strength by looking at the structural needs and understanding how the system works. In my experience, this sort of practical method rarely happens and I’m afraid less so with each passing year. Thirty years ago, preservation using modern materials and techniques was the norm. Now in preservation we have a great body of technical data about the pathology of deterioration processes and advanced methods for scientific analysis of conditions. Yet people tend to ignore analysis, or more often, make lots of rash assumptions and throw additional structural supports at perceived problems (surface conditions) without addressing the underlying faults. The consideration that most seems to drive projects is that the system look sound and neat (pristine) in a sort of Disneyland/Hollywood slickness that is the opposite of authenticity. 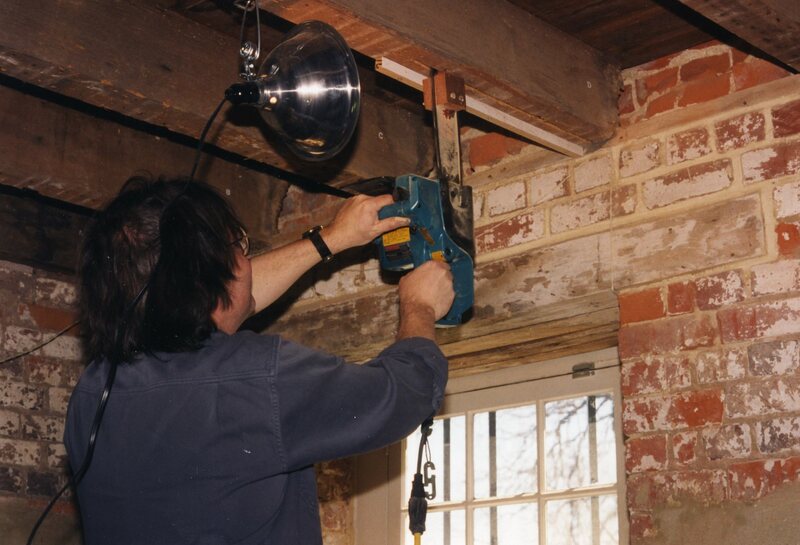 From the first time I began working on old buildings in 1973, I have continuously worked to make repairs as unobtrusive as possible. This invisible mending approach came from the prior six years of apprenticeship in cabinetmaking and antique musical instrument and furniture restoration. In those trades, the effort was always to try to fully understand the structural needs, the way pieces worked, to find compatible repair materials of the same origin and to design the least intrusive repair method, all with the goal of accomplishing a skillful and invisible repair. So as I began to repair buildings instead of furniture and was asked by the owners to “save all original material,” I took it as an interesting challenge and applied myself to using the same ethic on these larger-scale artifacts. Often I was dealing with exposed decorative woodwork that was weakened by fungal attack and weathering or painter’s scrapers, but was otherwise largely intact. Epoxy resins seemed perfect for the problems of buildings. Often the tooled surfaces created by the artisan several hundred years before were intact, although often only held together by many coats of hardened lead paint. Epoxy resins soaked into the soft cellulose fibers, where they cured, providing strength and integrity. With the resins cured, I could remove the paint and repair the missing portions as I would on any woodwork. An advantage of using heat to soften the paint was that it fully cured the epoxy resin to its glass-transition phase. I really enjoyed the challenge of fitting infill pieces of wood that I had shaped to the now-strengthened remaining original sections and then carving them to replicate the patterns. As I learned to sharpen and use each gouge, I began to see how each carving was different, to read the hand of each artisan, and in this the real secret was to catch and imitate the subtle tooling that gives life to decoration. In this new field of preservation we were striving for a light touch – less is more as one of my early clients used to say. This approach was exemplified by the three tenets of conservation – predictability, compatibility, and reversibility – the watchwords of this new field that recognized buildings as important artifacts that should be treated as we did objects in museums. We should not be the last people to experience these buildings in their original configuration and materials. So to be good stewards, we were trying to change as little as possible, to preserve and not replace, recognizing that every time we work on a building, we lose a little more of the original. As it turns out, the goals of predictability, compatibility and reversibility are difficult to reach and still a long way off. Looking back, I think these goals have been abandoned by most practitioners because the academization of preservation education has given them scant knowledge of materials and processes and no useful hand skills whatsoever. This leaves them to rely completely on off-the-shelf products and cure-alls supplied by a burgeoning and mostly cynical and unscientific “restoration products industry.” I guess this is the 21st century’s version of 19th century snake oil sales. Although epoxy didn’t meet any of the three requirements for conservation treatment, I felt that using it was better than replacement. I hoped in 50 or 100 years it might be possible to remove the epoxy if necessary. And I figured a worst case scenario was someone then would need to preserve the treated piece again or finally replace it, but that at least the information would still exist to inform in the future. I learned to scale up consolidation processes for larger structural timbers and developed methods that combined consolidation of weakened portions with grafted-on pieces and rabbeted, slotted, or dadoed joints with stainless flitch plates. One of the biggest drawbacks to using 100% solids epoxy resins is the darkening of the treated surface and, unless you are careful, a plastic look. So a lot of effort over the years has gone into developing methods to lessen these effects. A good example was alterations to the epoxy resin processes developed in Poland by Domoslowski for consolidating stone that used heated sand to keep the epoxy away from the surface. Morgan Phillips and I learned to start the cure reaction prior to dilution and then add up to 5 parts ethanol or IPA creating a solvent-cut resin that would easily penetrate a timber and cure in a dispersed form that was somewhat porous to water, strengthened the wood fibers, and yellowed in UV exposure only slightly and then very slowly. The floor joists treated with this method at Londontowne are a good example of this hybrid approach. The exterior shell of the joist is toughened without any change in appearance. 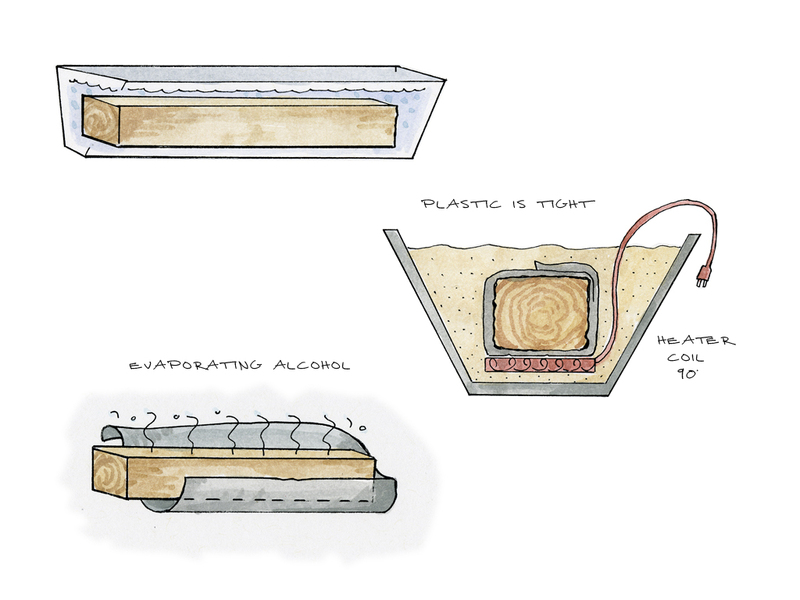 Then a new core of ¼” stainless steel carries the load to a ledger placed in the brick wall. A wood spline filled the slot for the steel and wooden pegs filled bolt holes. All of this was accomplished from the basement without removal of the joist or damage to the floor above and was completely invisible to visitors. So this approach is rooted in appreciation and understanding of the original structures (not replacement or “improvement” with modern structural systems) and uses a combination of skilled woodworking, ironmongery and polymer chemistry. I’ve been at it long enough that I have quite a stable of repairs I can return to for evaluating their effectiveness. In most cases they are still sound, although I try to improve these techniques on each job, aiming for the least intrusive approach. Epoxy-to-wood in-place repairs work, but I think they are often still too intrusive and intractable. We have been going back and forth reevaluating existing techniques and trying to imagine better ones. One side says let’s do very sophisticated furniture-type repairs subtly distressed so they repairs aren’t obvious (see first few sketches of hybrid wood-carbon fiber repairs). These are a challenge and great fun to carry out as they force you to really stretch your craft skills. And they make you proud. Another side says lets make the repairs in a modern material – say glass with it’s wow factor – to make an almost invisible non-repair repair. Or maybe we could infill or support pieces on aerogel sculptures and blocks. These explorations and discussions have continued for several years and have brought us back to many of the same treatment dilemmas that we have been bumping into on other projects. 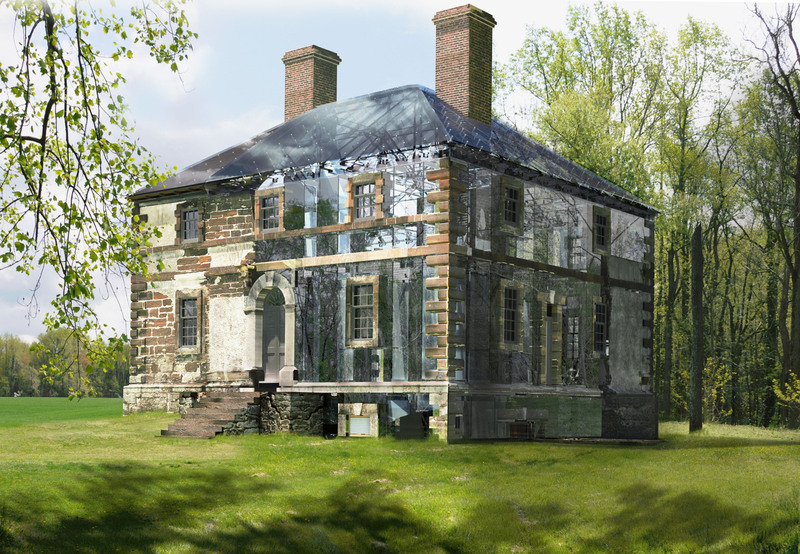 Once we accepted the glass house as the only way to protect the ruin and realized it had a good chance of succeeding, we decided it was time to move to the next level of conservation techniques. As you know, we believe there is no point in picking easy tasks such as trying to make minute improvements in current techniques. Menokin demands we do radical things; take big strides forward. If we can develop a proven methodology to elegantly reload the joists, then we have the methods for saving the rest of the building. By starting with some of the most difficult problems (nearly all of them contained in these two Northeast quadrant girders), we are forced to go beyond anything we have done before. If this sort of herculean effort to save original material had not been ongoing in sculpture, furniture and the decorative arts, we would not still be able to enjoy Michaelangelo’s David or the Mona Lisa. If the task before us today was to save a van Gogh, there would be no question that we could find a way. We could not as a society fathom the loss of so authentic an experience. Whole buildings are much more complex than any single work of the decorative arts. They therefore demand integrate approaches and cross-trade skills. I believe when confronted with the real thing, even by novices, authenticity in buildings is equally felt. But buildings are at far greater risk, being the vessels in which we live and work but for which we generally have little regard. We need only a low to moderate strength polymer for strengthening and toughening most deteriorated wood surfaces. 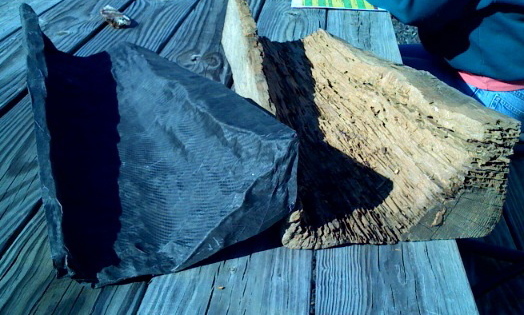 Most deterioration in wood is on the surface and leaves solid, strong cores. Consolidants must not change the appearance of the treated area and, again, must actually be reversible. We need to approach making things strong enough by cushioning them and supporting loads over a larger area using materials that can be replaced, removed and improved without destroying the original artifact. To this end, we have been working with Chemist Richard Wolbers on a new consolidant – using dibasic sugars – and the initial small tests have been promising. 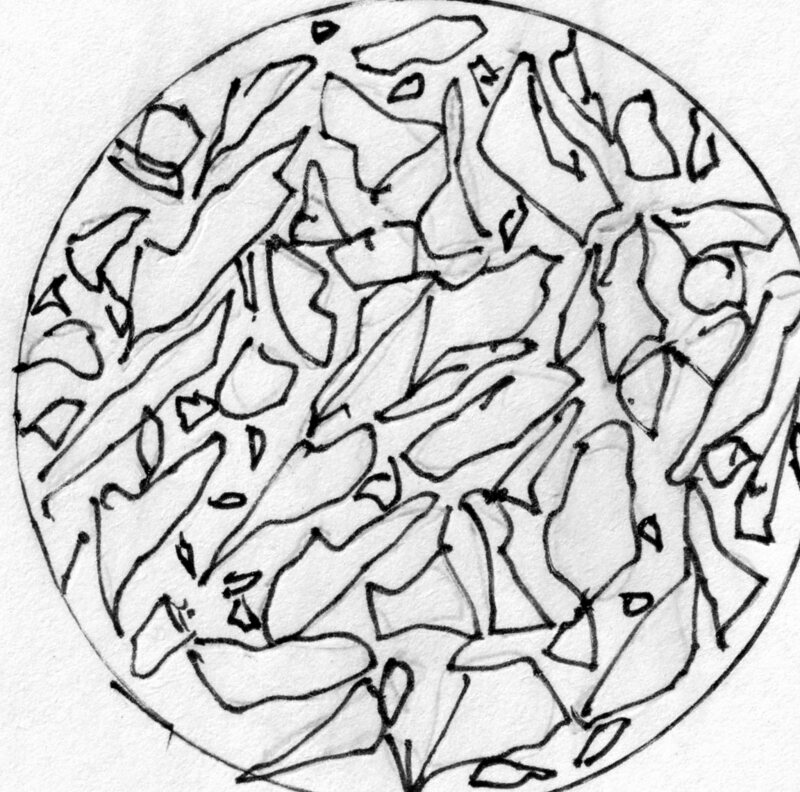 Dibasic sugars rebuild cellulosic polymers in the airspace of timbers. (Void spaces are 60% of any sound timber, hence wood is relatively light and rotten timbers have even more void space). 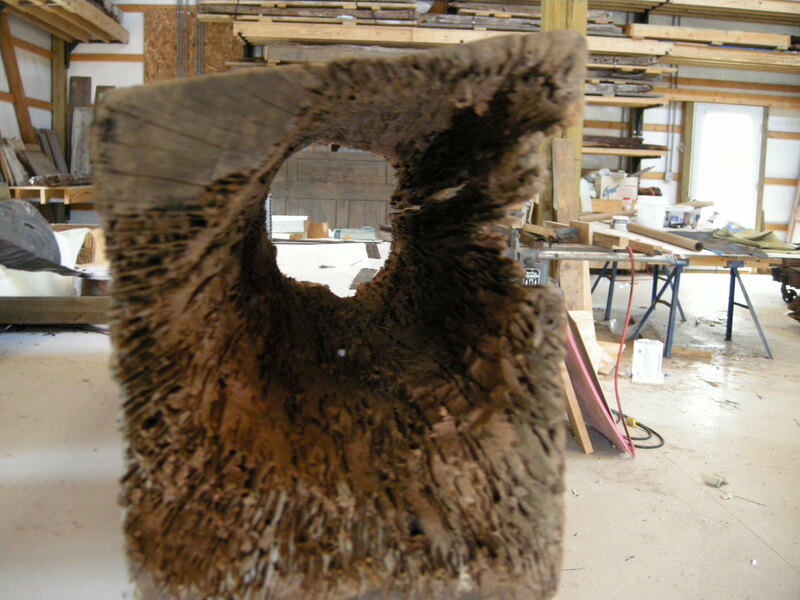 As the solvents evaporate from a 1-2% dibasic sugar concoction, the structural sugars begin to self-form onto the existing cellulose in the wood. 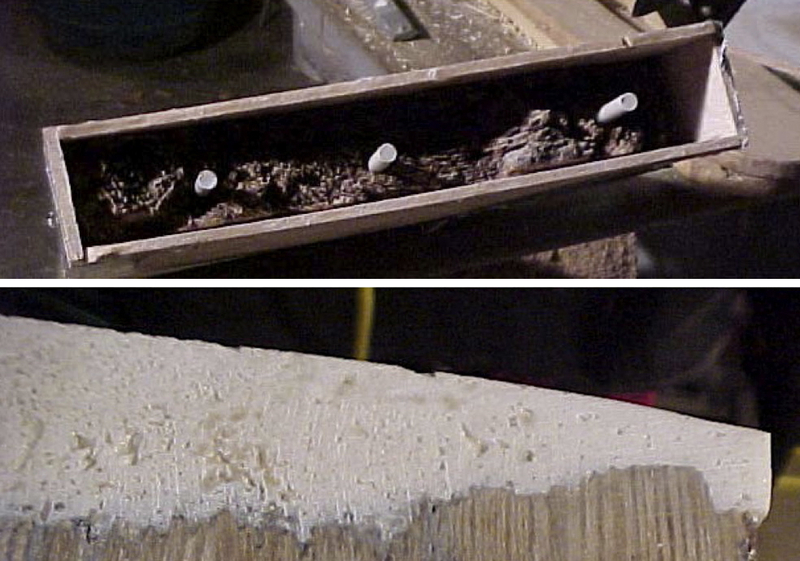 Small tests in the laboratory have contributed to a 400-500% increase in compressive strength in weakened timbers – and these long-term compounds appear to be reversible in practice, not just theory. The next stage is to scale up testing larger elements and working out delivery systems. 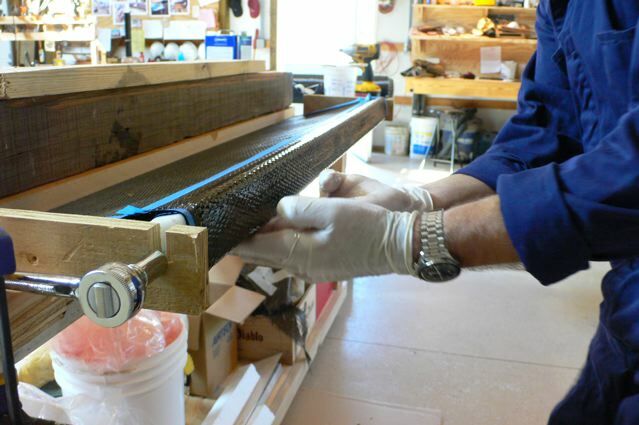 In tomorrow’s post: how we replaced the center of a small section of hollowed-out timber with a carbon fiber core. Click here if you are interested in better understanding the big plan for the Menokin Glass House and its re-incorporation of original damaged timbers back into the building. It’s about time for a change of subject (to something really different like carbon fiber), but before we do, I wanted to put the awesomeness of fractal geology into perspective as we finish up this segment on making mortar. Now that we have located a matching aggregate, it’s time to make some mortar. In the process we will also try and understand more about the geology of this area as well as explore the fractal nature of geological deposits. We are digging in the foothills of the Blue Ridge mountains. They are part of the Appalachian mountain chain which stretches form Newfoundland to Alabama. These are one of the oldest mountain ranges on earth. At one time, these were as high as the Rockies or the Himalayas are now, but they have been weathered down over hundreds of millions of years. This Piedmont province is primarily underlain with granitic rock, quartzite, phyllite, and acrostic sandstone which for me is an interesting and unfamiliar geology for building materials, very different that what I encounter along the coastal plains. 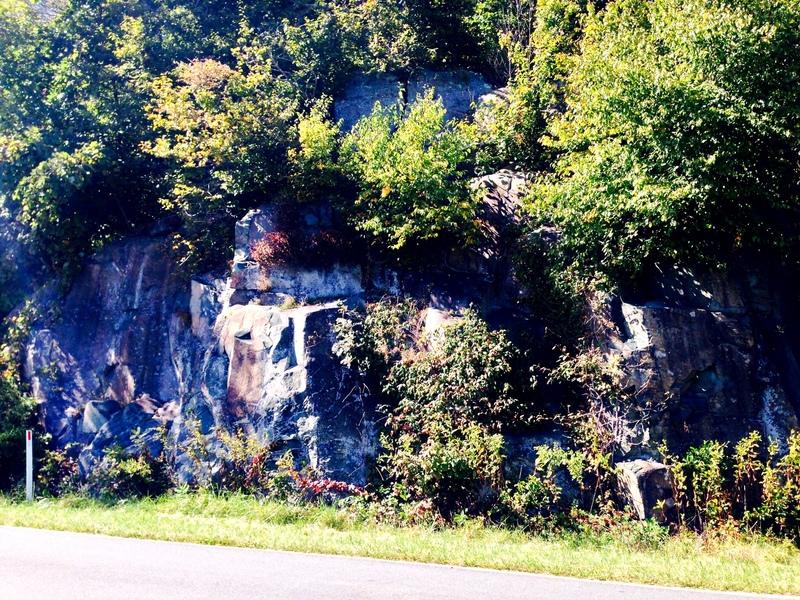 The underlying granite peaks out from the side of roadways here, but few in the area may recognize the rocks that populate their backyards are this same granite worn down. Once you digest a mortar, you may not be able to identify or name the minerals, but you can begin recognizing the same aggregate under your feet. As we began rinsing the aggregate from this site, we realized we had seen these same minerals in DC. But there they were more rounded from tumbling river action as they passed over the fall line, with the more soluble components dissolving, before being deposited where the Potomac River fans out into the marshes on which the Capitol city is built. Acrostic sandstone – which comes from the breakdown of granitic rocks – is found throughout. Typically it contains loosely clay-bound stream bed depositions of quartz, feldspar, potash and granitic rock fragments that can be worn down into the components by crushing or river action and dissolution. I pushed the soil through a 1/4 inch screen. 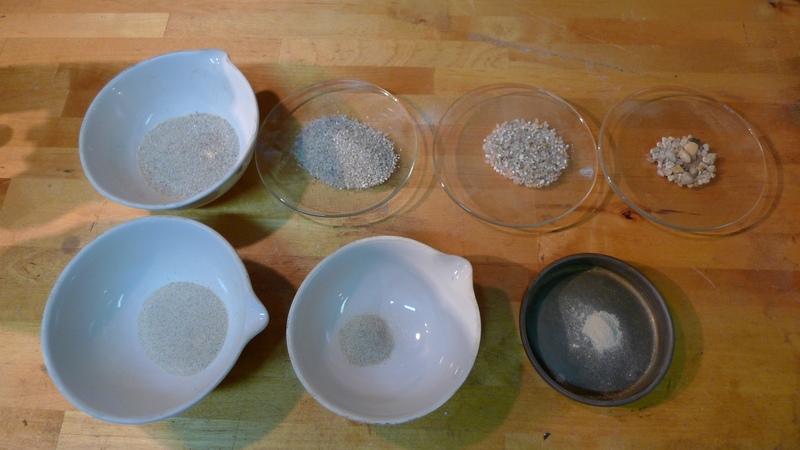 After initial sieving, but before crushing, there is a lot of larger pieces. I crushed them as best I could and further screened them. Many were too hard to crush this way so I set them aside in case we later decided to use some mechanical means to break them up. My low-tech version of mechanical crushing for this small batch. In the second round of sieving, I further crushed the soil while trying to push and grind the aggregate across the screen. 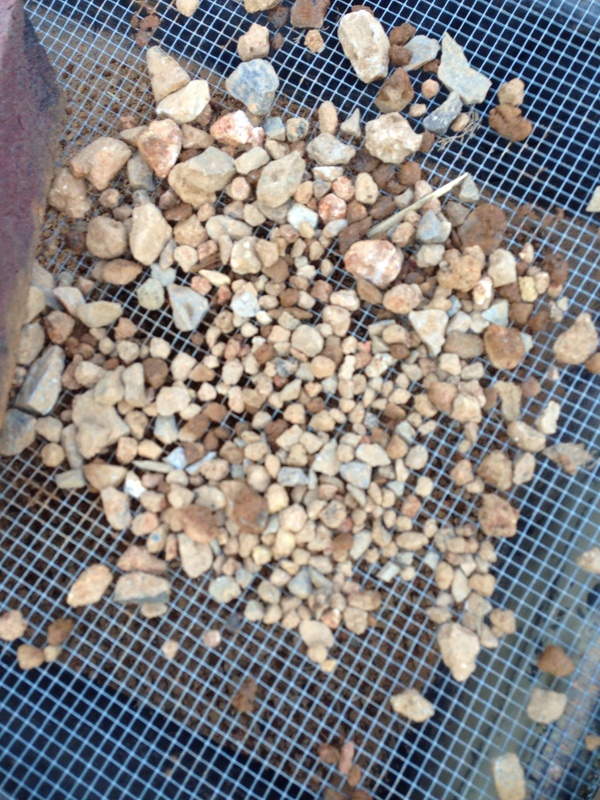 This is the aggregate retained on the screen after sieving … and the sieved aggregate, now ready for washing. When you are looking at a pile of rocks and dirt, it is easy to loose perspective on what makes up those aggregates. 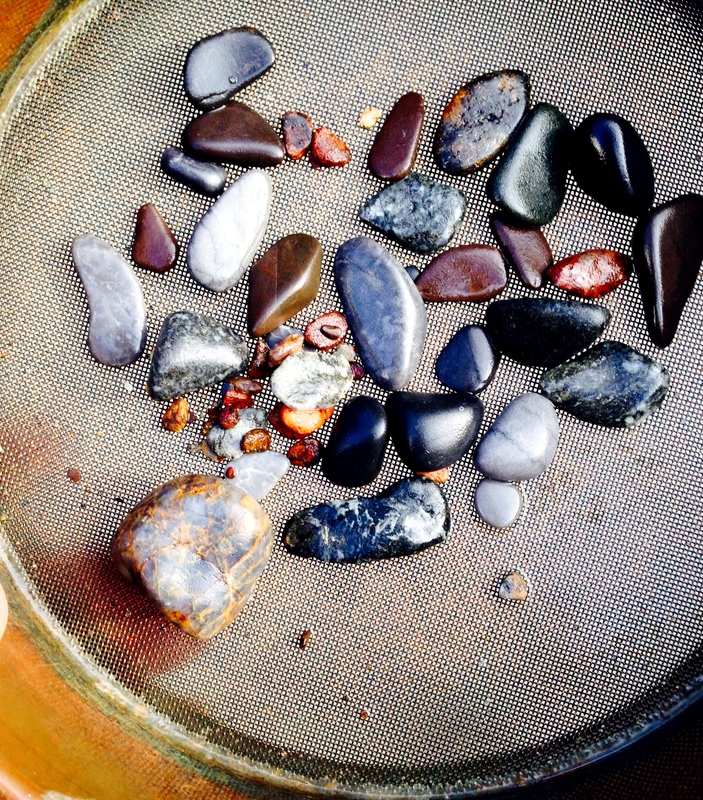 I decided to take a handful of the rocks that had not gone through screen and put them in a rock tumbler so I could polish them up for easier identification at a scale I could see with the naked eye. Of course I’m now thinking of a side career in jewelry making these things are so beautiful. 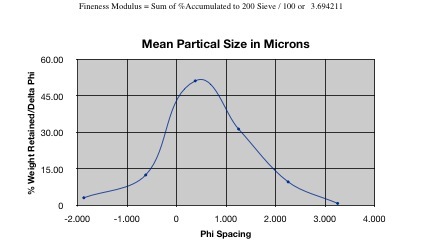 You will also notice that the shapes and percentages or particle distribution are similar, regardless of the scale you are at, whether looking at the mountains or soil beneath your feet. This is the fractal quality of geology. 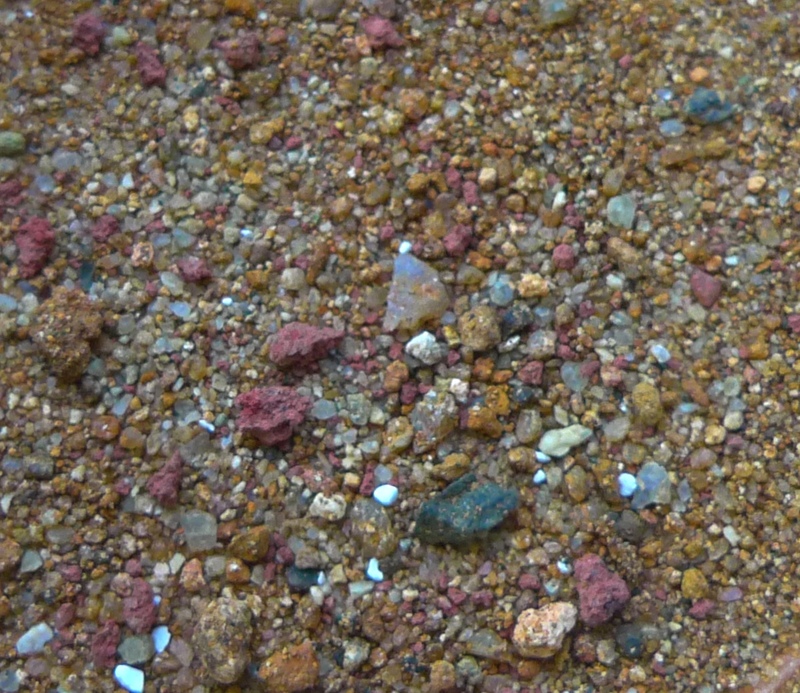 Whether in the distribution of big boulders seen along Skyline Drive or the size of rocks people dig out of their gardens which match those in this picture, or the grains of “sand” in the mortar in historic buildings of the area, the same proportions of the same minerals are showing up, just in different stages of the weathering process from mountains down to soil. What we are looking at here is what geologists would refer to as poorly sorted. 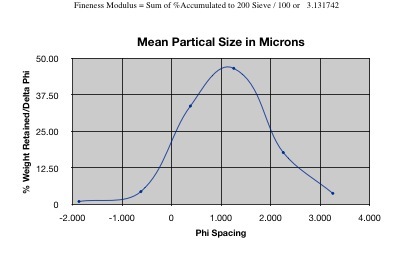 In other words, there is a wide variability in the size of particles next to one another. 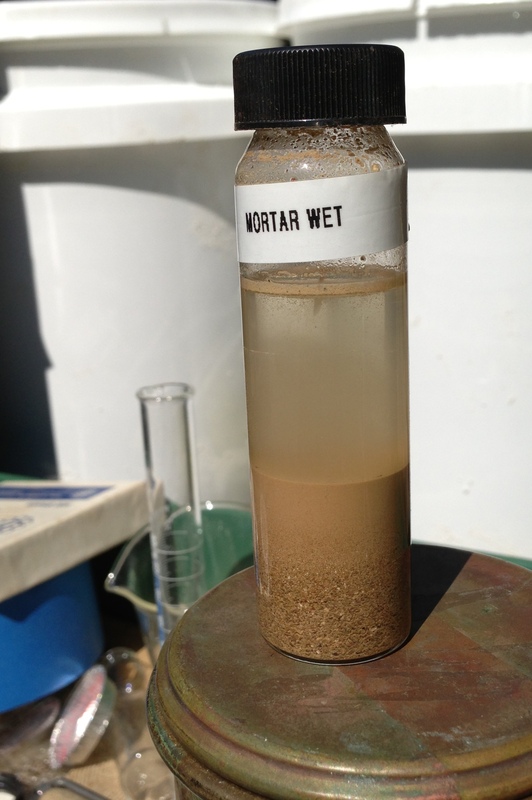 Silty mortar below the watertable … versus the upper wall mortar which is cleaner or more free of silt. There is such care given in the joints up high, that I now wonder whether the lower wall was always parged and only more recently the failing softer early lime parging was replaced with cements. So now, it is time to begin rinsing the aggregate to determine how much washing are needed to match the mortar both above and below the watertable. Again, the mortars do look very different, but the aggregate is the same, only much more of the silts have been washed from the mortar above the watertable. First you will notice just in beginning to shake or disturb the water that the silts are lifted as the aggregate falls. We will use this tumbling of water to wash the silts away, pouring off the silts from the top, before adding and rinsing with fresh water. The question is how many rinses will be needed. After three washes, the volume of the aggregate is shrinking as the silt washes out. 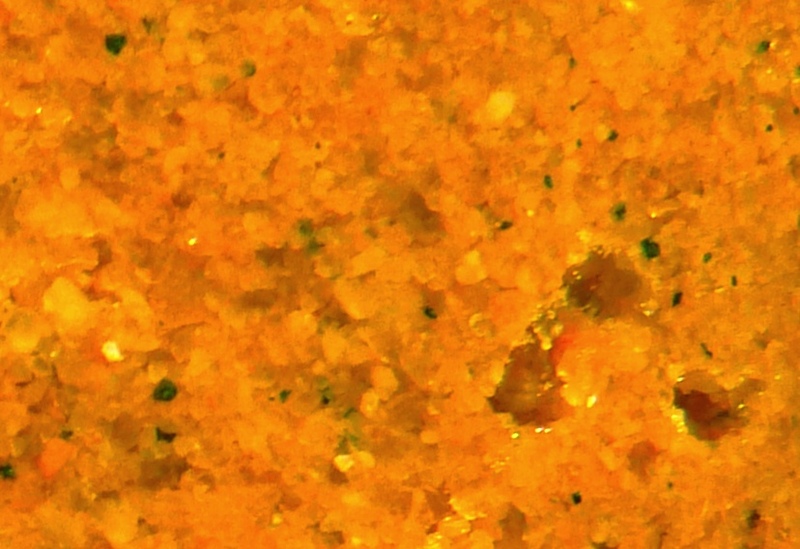 Individual aggregate grains are now visible. 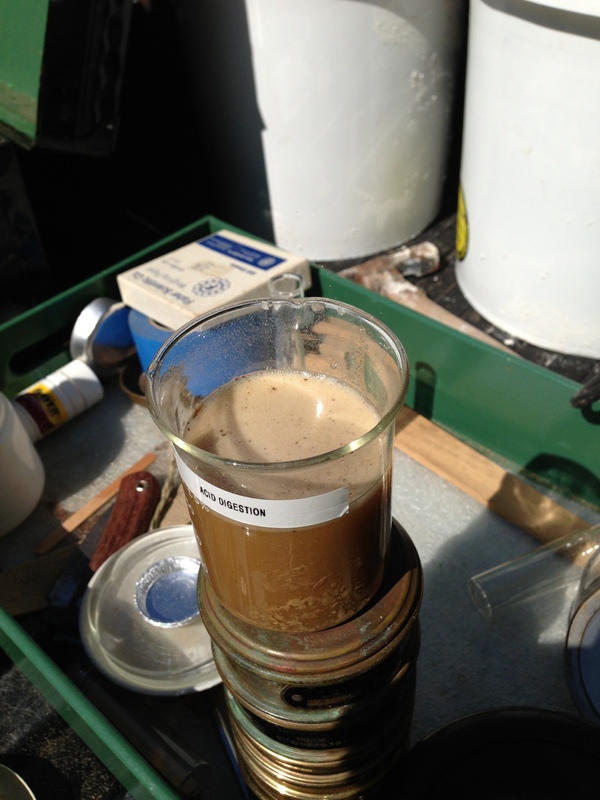 It is time to make a 1:3 lime:aggregate batch of mortar to see if this matches the dark mortar below the watertable. 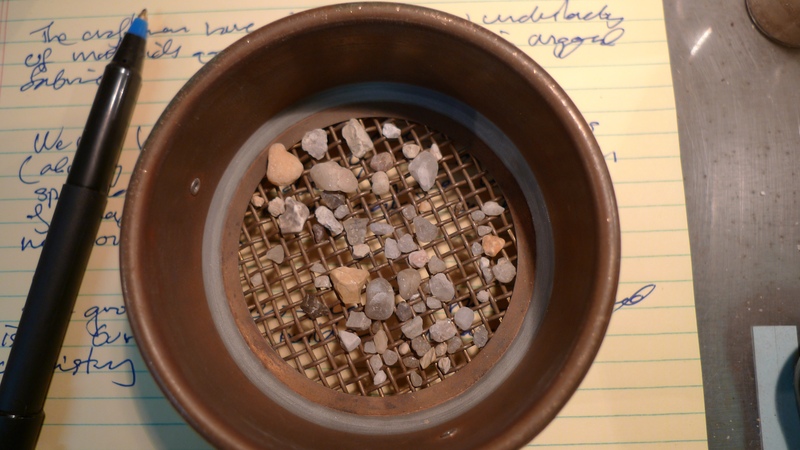 Sure enough, the wet and cured mortar samples at three washings are a good match. It ends up taking ten washings to get most of the silt out to make a good mortar match to the upper wall mortar. Now I think it is time for a change of subject. 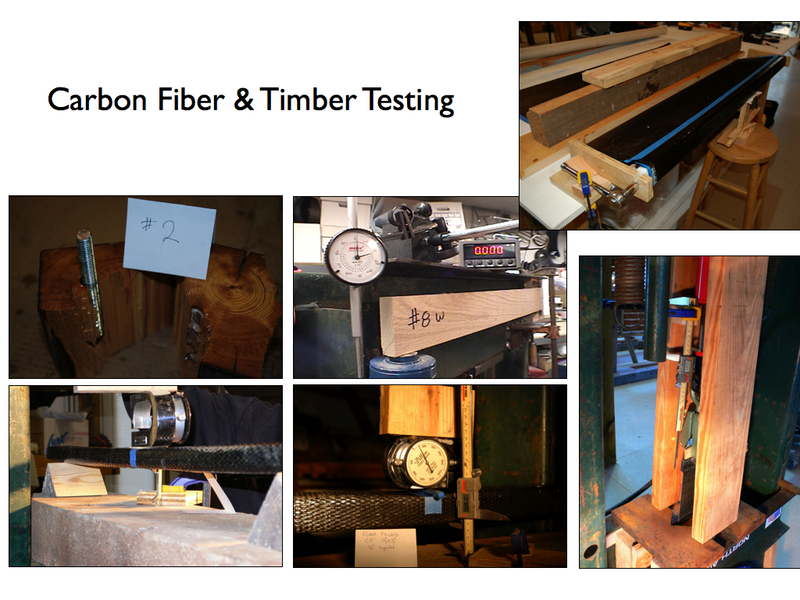 Coming up next: an introduction to uses of modern carbon fiber technology for repair and reinforcement in historic structures, and then a little bit on woodwork. We were both working on the Wyck project in Philadelphia and I had just begun working with lime mortars and renders. I did not fully understand the reasoning for this problem with sand, but decided that I should switch to alcohol to measure the void space in aggregates. My understanding then was that surface tension of water might be affecting it and alcohol would give a more accurate reading. Recently I have questioned my practice of using alcohol instead of water and decided to conduct some experiments to see what I could learn. *As you’ll see below, my findings are the opposite of both Morgan and ASTM’s statements (starred above). Has a typo in the past just been repeated and magnified? 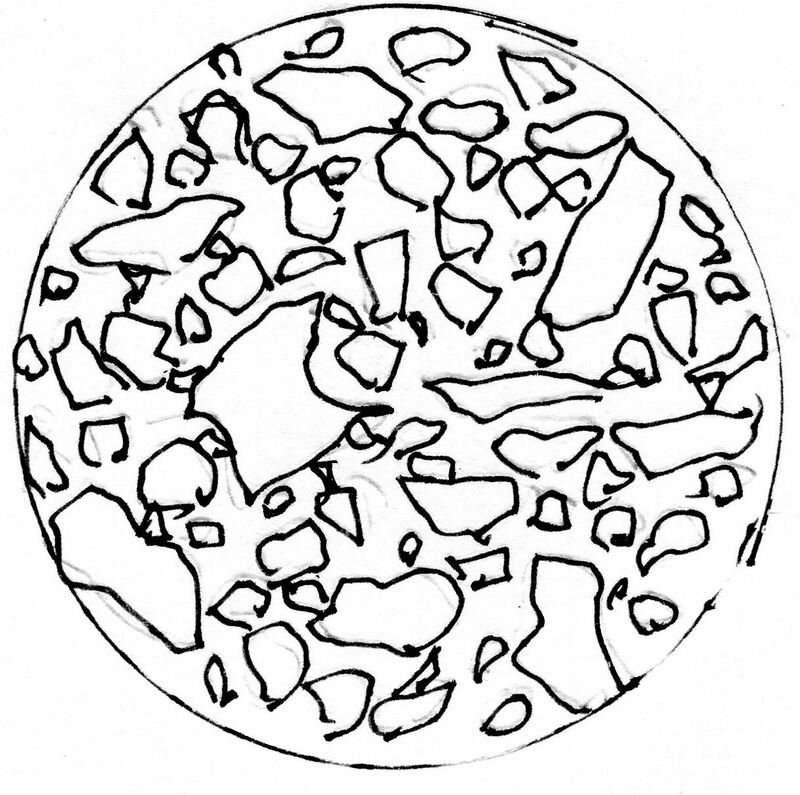 The basic idea behind determining the void space in a mortar (and thus the ratio of lime needed to adequately cement the sand) is that you take a given amount of sand, and add liquid until the sand column is saturated with no additional liquid on top. For this particular sand the amount of alcohol needed was 34 ml meaning that 100 ml of dry sand has air space of about one third of its volume. This then equates to a lime putty-to-sand ratio of 1:3. But does it really matter whether I use water or alcohol (200-proof ethanol)? I repeated this test with both alcohol and water several times with the same sand the results were within 1 ml each time. 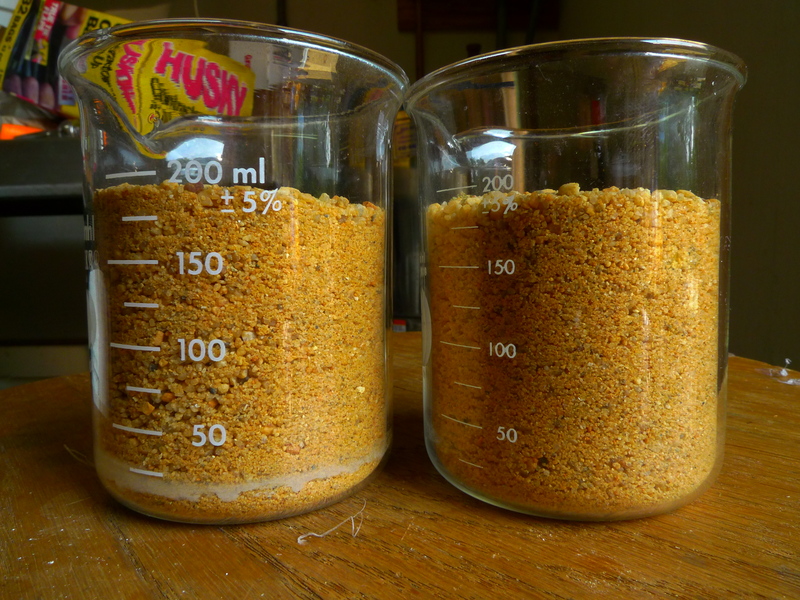 Next I filled two beakers to exactly 200 ml with sand from the same container. 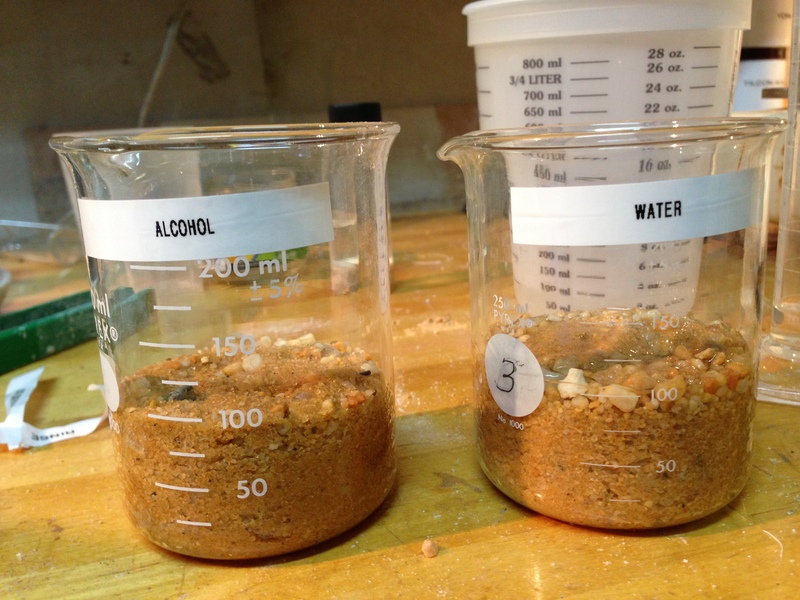 I added a measured amount of water to both, but stirred the sand in the beaker on the right. Then I tapped both beakers several times against the bench top. 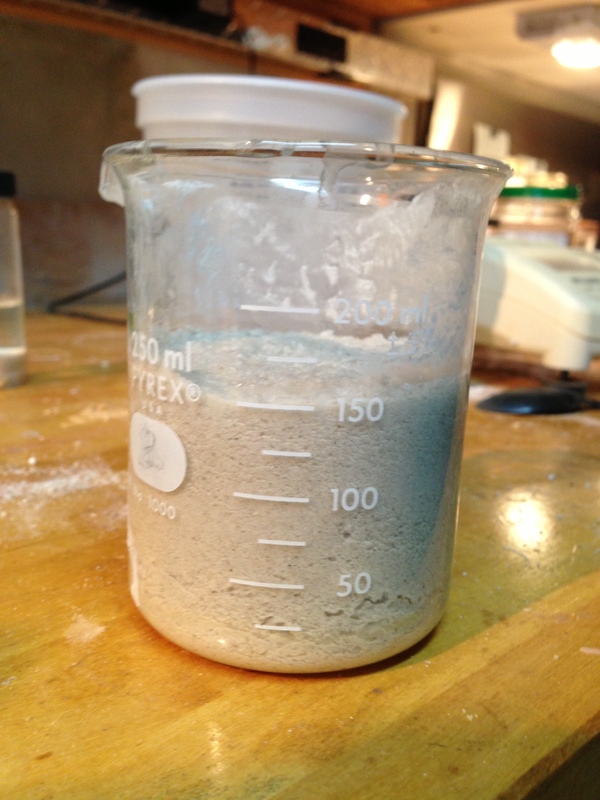 The un-stirred sand decreased in volume from 200 ml to about 185ml. 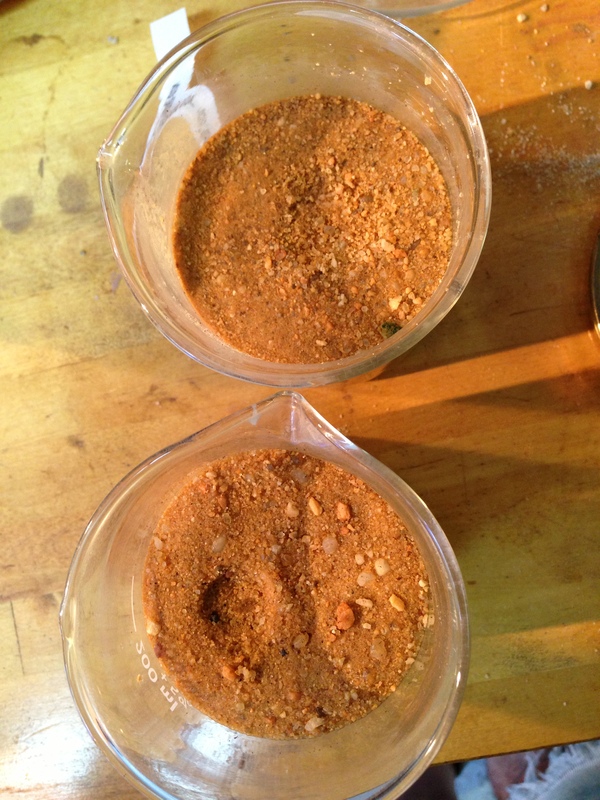 The stirred sand decreased to 175 ml. The difference in the packing density is evident. But even more interesting is the difference in the the pore space based on the volume of water required to wet each sand. 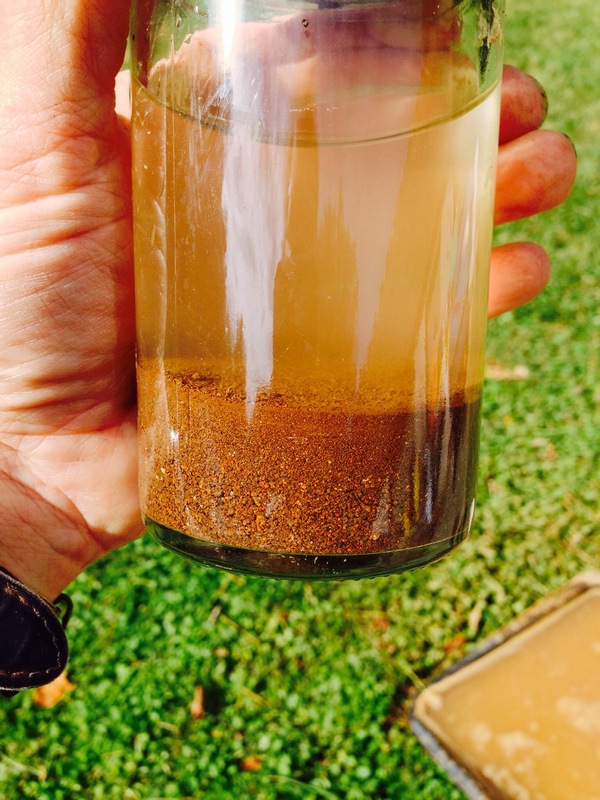 The 185 ml sand took 68 ml of water, the sand at 175 ml needed only 55 ml. 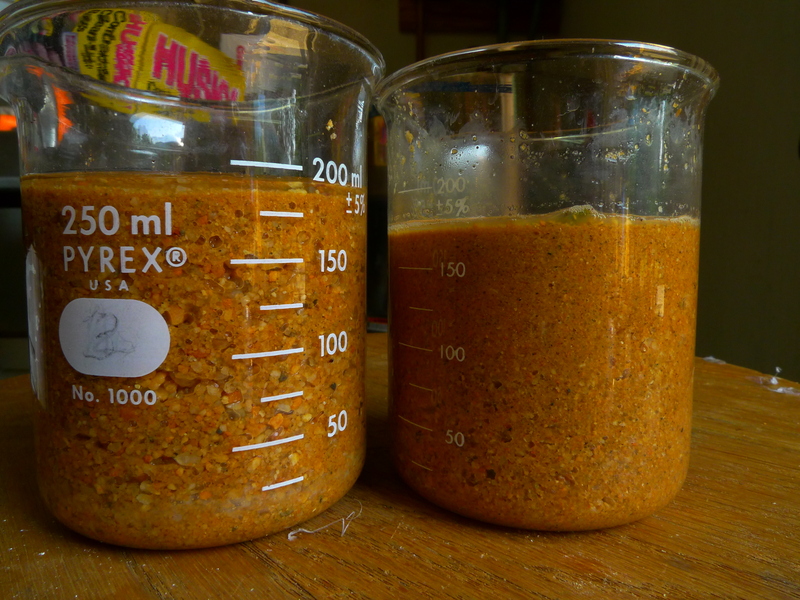 In the first case, I added water slowly until the sand was just wet, whereas in the latter case I poured in 100ml and then stirred it before pouring off the excess water, measuring what was removed. The difference is obvious. 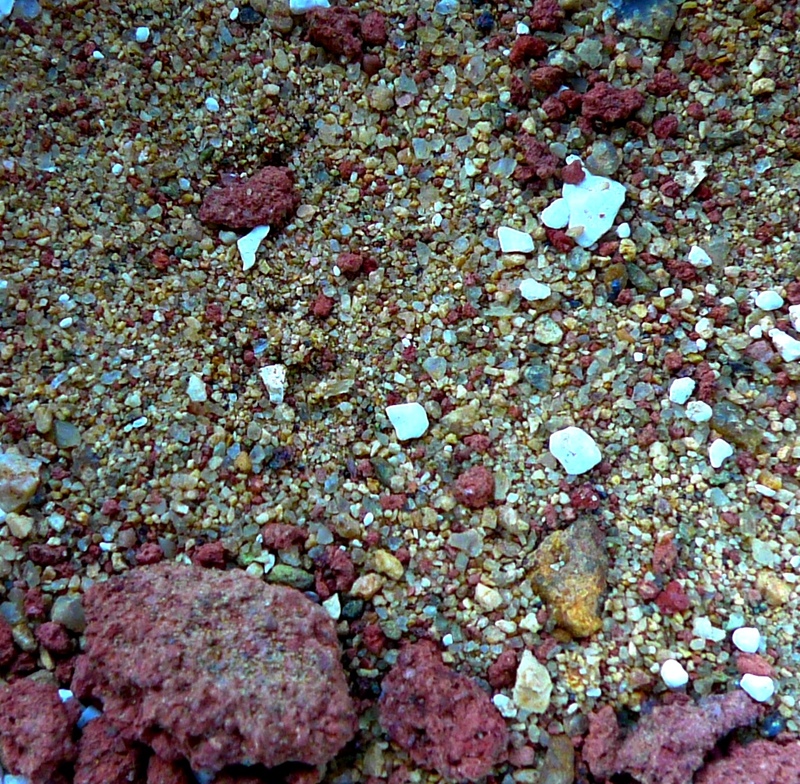 The stirred sand has reorganized and efficiently packed the different sized particles. This causes the void space to decrease. 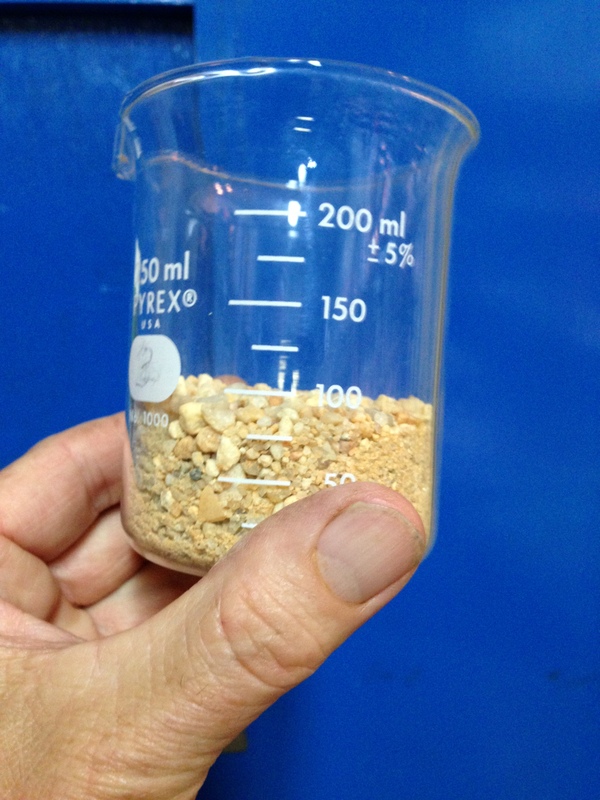 It seems to me that we should be basing our lime to aggregate ratio on a well packed sand that represents the relationship of the particles in a cementatious environment. It is also interesting to note how dense the compaction is when the water was stirred. As you can see, the unstirred sand at bottom will still take a fingerprint, whereas the stirred sand is so compact I could not make an imprint. I guess if we think of any trip to the beach and the density of the sand as the tide moves out compared to that further up the shore, none of this should be a surprise. Another thing I’ve learned from this experiment is the reason why our calculations for the amount of stucco needed for a given area often falls short. 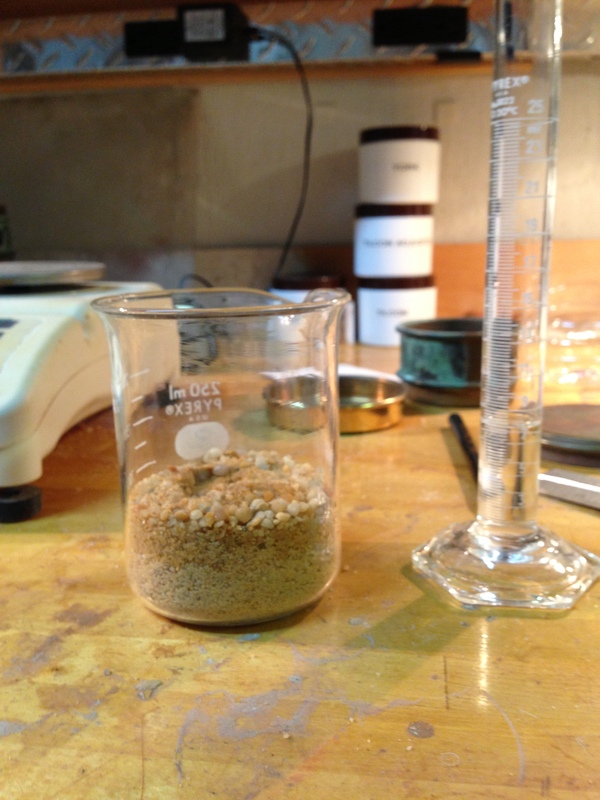 I have repeated this experiment with several different sands and have volume reductions between 12.5% and 17%. Since the sand volume decreases when wet it is important to determine shrinkage percentage for the particular sand to be used. 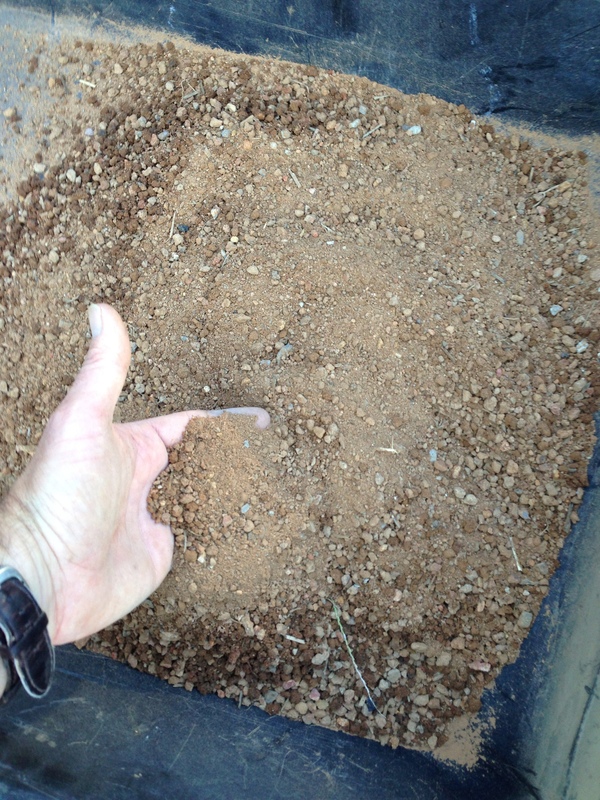 For instance, if you needed 100 cubic feet of mortar (as measured from dry sand), your mix, depending on the pore and void space in the sand, your finished mortar could be as little as 83 cubic feet. If you (inadvisably) used crushed rock, it could be as little as 75 cubic feet. Looking back at the crushed rock discussed in the previous post, I decided to see what would happen when it was wetted out. The result was quite shocking. 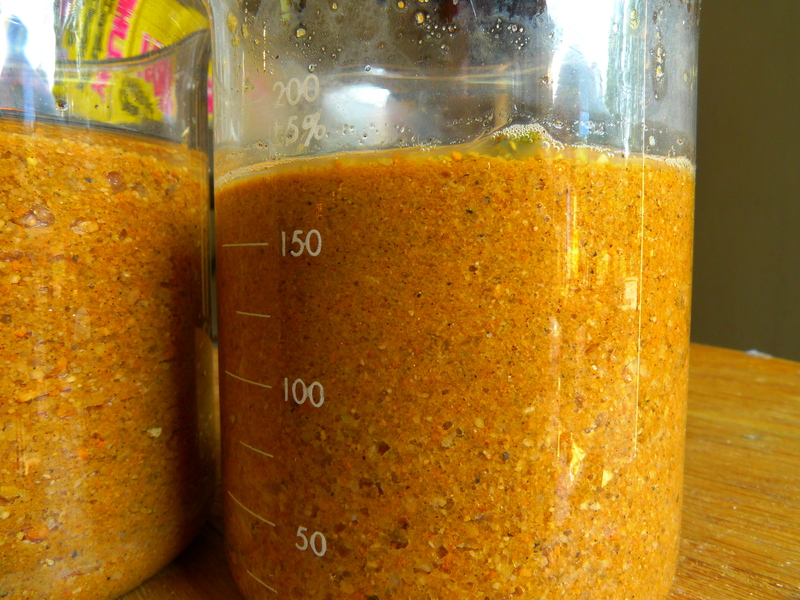 There was a full 25% reduction in volume when water was added and stirred in. Going forward, I am going to make up some mortar samples with pore space measured both by the stirred and unstirred method and set them aside to cure. In a few months we will have some testing results from these samples. I’ll also repeat these pore and void space measurements with water at room temperature versus that between 37 and 39°F when water is densest to see what affect if any it may have. 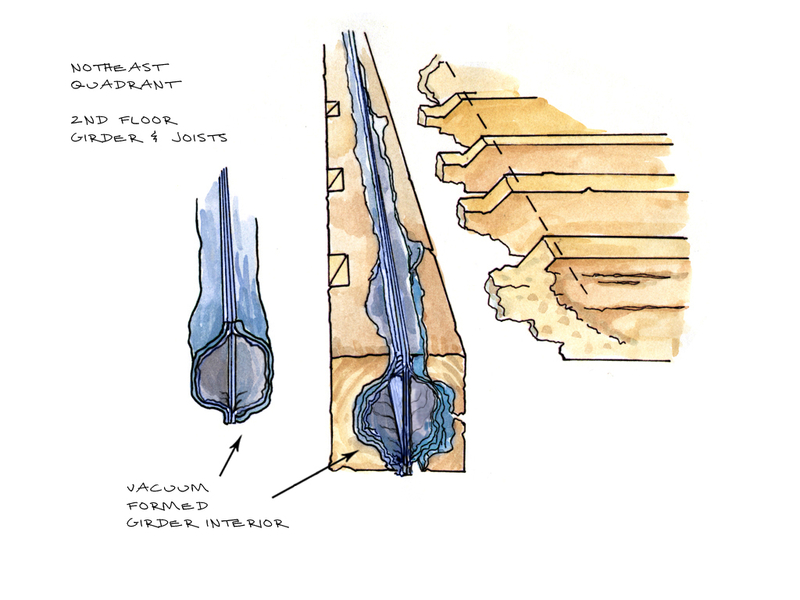 Bryan Higgins, a member of the Royal Society, studied mortars to learn what was behind serious structural failures plaguing London’s post-Great Fire of 1666 rebuilds to re-learn what had been forgotten within the building trades about making good mortar. He and Joseph Priestly competed for the recognition of carbon dioxide in their treatises on different kinds of air. Today I want to look at three different sands I have run across on construction sites in the last few weeks. 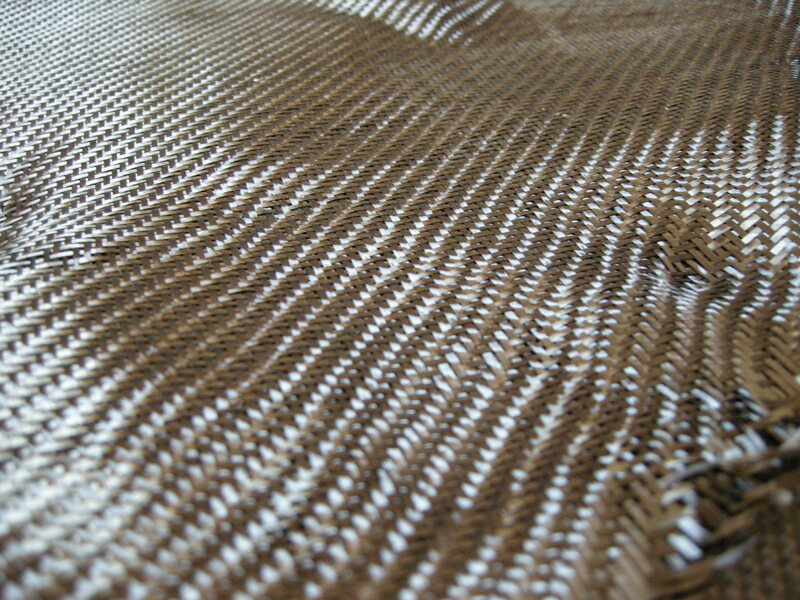 The gradation of aggregate has a profound effect on the performance and working qualities of stuccos and renders. The aggregate at left looks reasonably well graded. 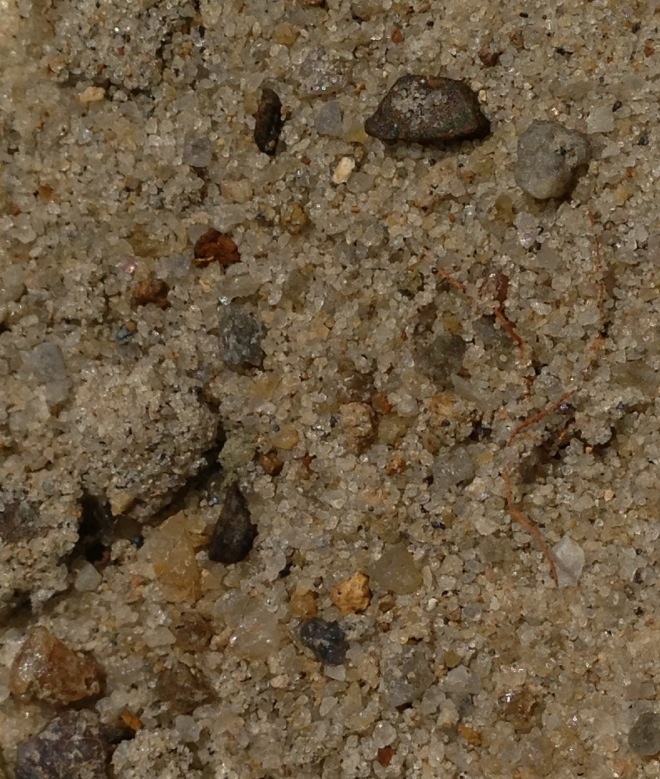 While one might be inclined to think this is a sand, it is in fact crushed rock. Most of the aggregate produced in this country today is not natural sand and gravel but crushed rock. It is a huge industry supplying concrete, road construction and other industries. 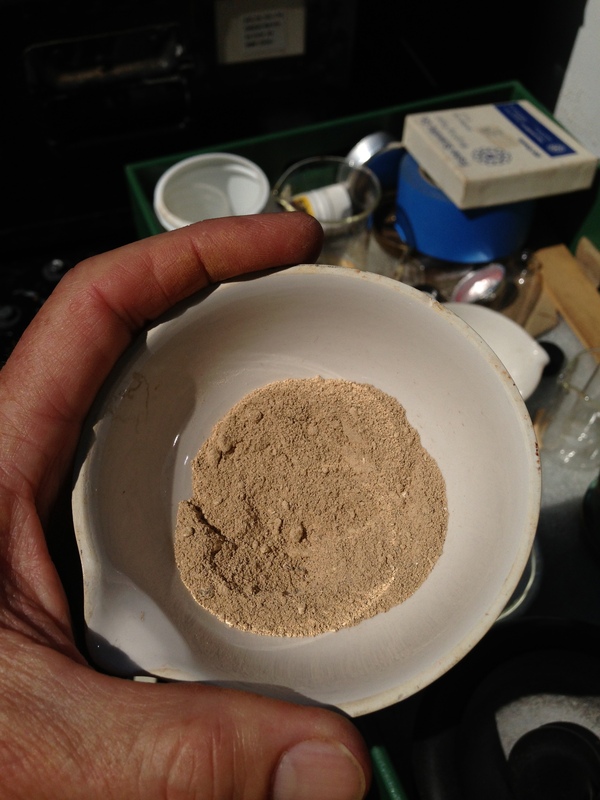 This sand came from a contractor who was installing test patches in preparation of stuccoing a large brick building. They had hydrated the brick wall starting the day before and the lime putty used to make the stucco was of a very high quality. Yet the stucco kept cracking even after being compressed with a wood float. When they asked for our input, my first thought was that the initial coat may have been a little thin which can lead to rapid water loss by suction from the brick substrate. But as we pressed on the second layer a surprising thing happened: the stucco patch separated from the wall. What could have caused this? I took a look at the aggregate by itself. At first glance it looks ordinary, but as I spread some out across my palm I realized it had an odd texture. 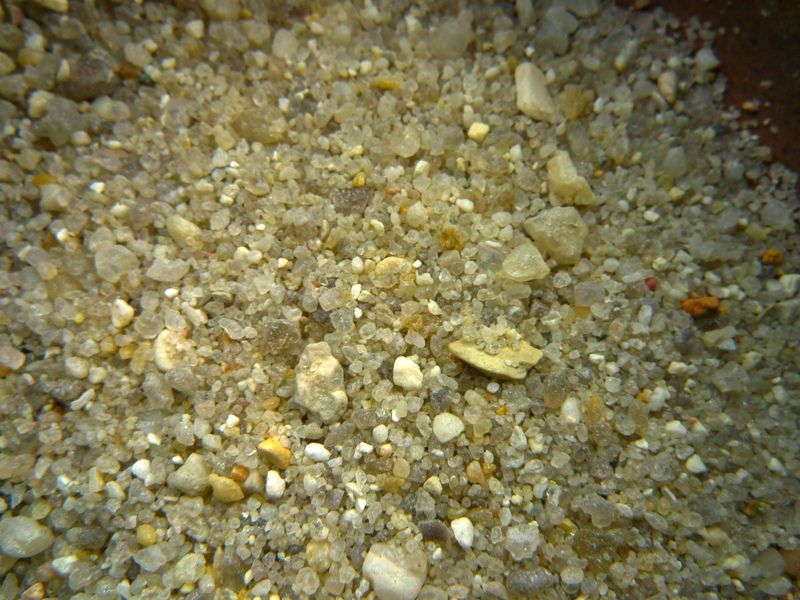 Looking at a few grains of it through my loupe I could see this was in fact a crushed rock. 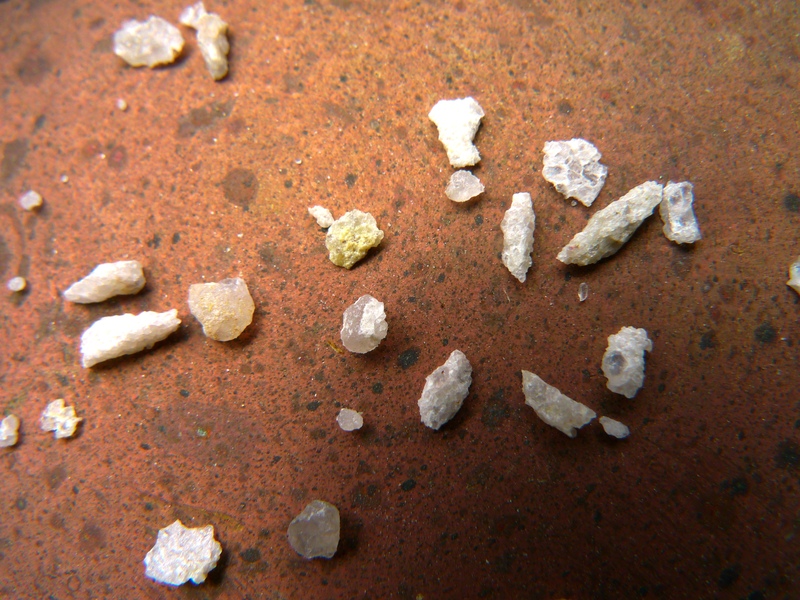 The crushing process produces mostly elongated flaky pieces. You can see the fractures in individual grains. Aggregate like this might work in mortar for laying bricks (although I wouldn’t be so sure), it would not work well for stucco. It’s rough and therefore has a large surface to volume ratio making it harder to mix and tougher to adequately hydrate. The individual grains themselves have tears that must be satisfied, increasing the void and pore space in the mix. An ideal plastering sand would be more cubical in shape. This crushed stone will not pack well and thus not compress well. That will make it hard to adhere to a surface. But as critically, it will not hold its water well through carbonation so that there is likely to be considerable shrinking and cracking. Lets look at the sieve data on this aggregate to see what passes each sieve with this crushed rock. With the crushed rock, you get something more double-peaked than a smooth curve and the working qualities just aren’t there. About this same time I got a call from a homeowner who was making a lime-sand plaster to apply to the wood lath in his nineteenth century home. He had carried out the pore space test to determine he needed a 1:3 mix (one part lime to 3 parts sand). He was trying to make his mortar by hand in a mortar pan and things were not going well. No matter how much he mixed it, the plaster was lumpy and not sticking to itself. I looked at the sand he was using which was an “all-purpose” bagged mix from one of the big box building supply stores. At first glance this sand looked ok. But looking closer, I realized it was a blend of sand and crushed rock. Back to the contractors trying to find a good sand for stucco, they sent me another sand for consideration from York PA. They knew this was a pit sand, being dug near a river, so there would be somewhat more rounded particles, but it was a natural sand. Up close note that the sand is mostly cubical (as it should be), rather than flaky like the crushed rock. 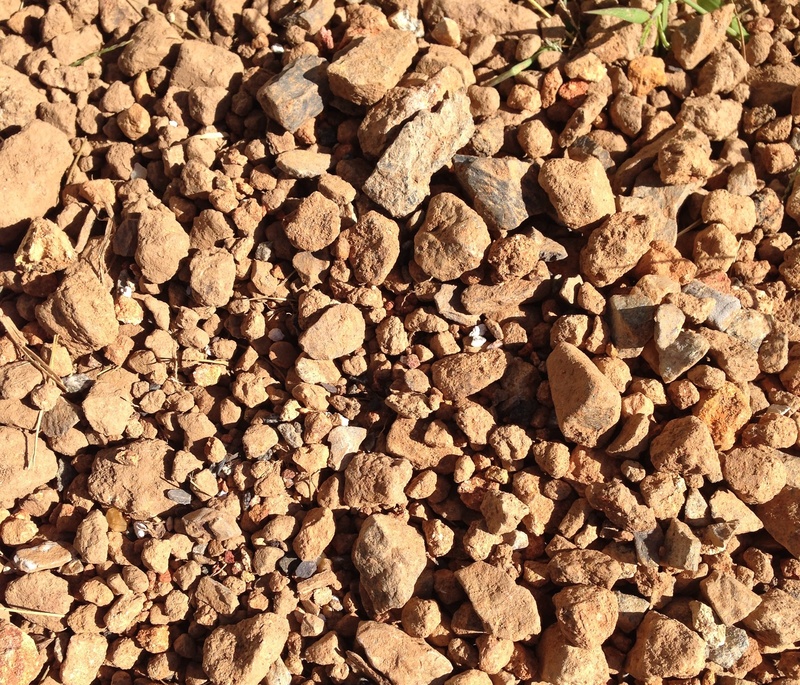 Grading of aggregate can have profound effects on performance and working properties. Aggregates are graded in different ways for different uses and industries. 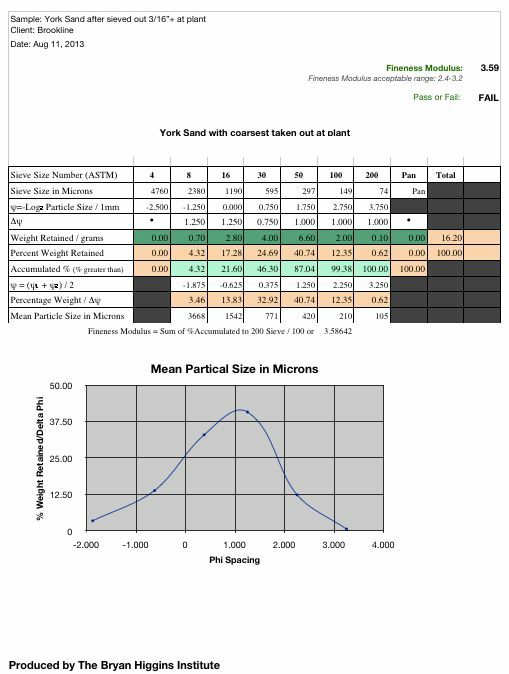 For most lime mortar uses dense grading is preferred. Which is shown in the graphs above. 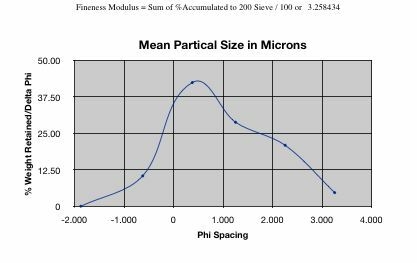 You are trying to achieve a good distribution of particle size so there is a maximum density of aggregate with low void space. In open grading there are few fines which leads to more void space and therefore more binder is required. Angular or sharp sand has a cubic angular shape that gives stiffness and strength. But these may not be the most workable for stuccoes. When stuccoing, I prefer a good combination of sub-angular and sub-rounded. Rounded aggregate creates less particle-to-particle interlock and can be easier to work and compact. Flat particles or elongated ones like you typically get in crushed rock impede compaction and, although they may be alright as a bricklaying mortar, they are difficult to use as a stucco. Another thing to be aware of is surface texture. A smooth aggregate with lower surface-to-volume ratio will be easier to wet out and to mix whereas a coarser texture with higher surface-to-volume ratio will take longer to mix. 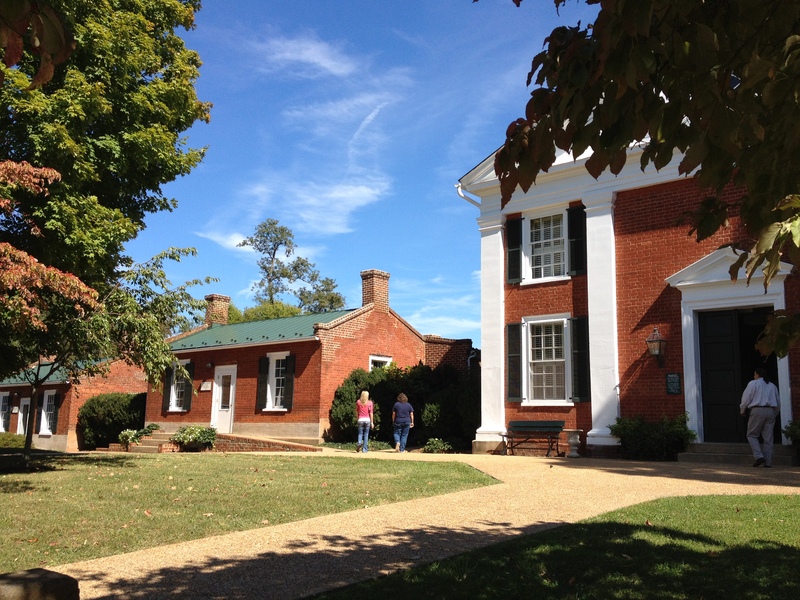 The last few days I have been looking at several early to late 19th century buildings at the foot of the Blue Ridge Mountains. To match the historic mortar, we need to find the aggregate source. Yesterday I took some mortar from an area of failing mortar and parging. 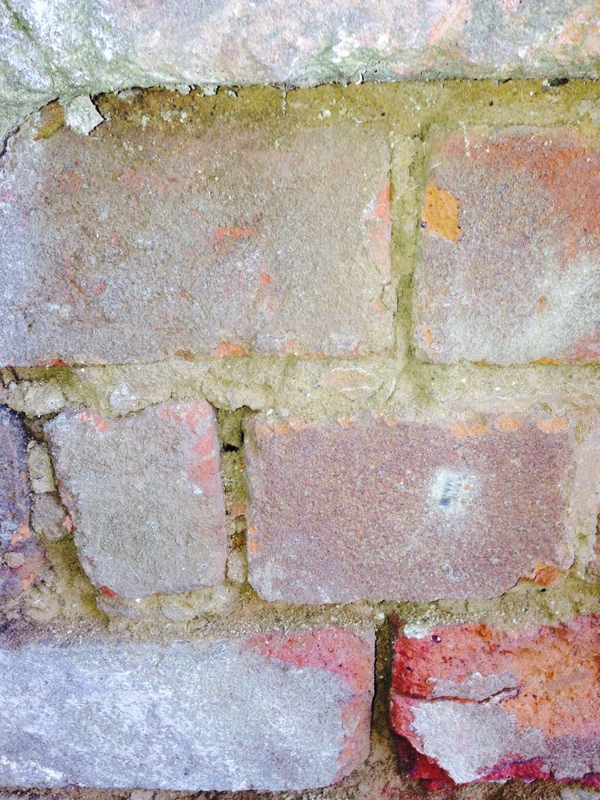 Once the portland materials are removed, grade changes made to effectively move surface water away, plus the salts poulticed out of the lower masonry, then missing mortar will need to be replaced. Since the sand used to make the mortar as well as the clay for the bricks was almost certainly from this site, it makes sense to find it and use it since it will match exactly. 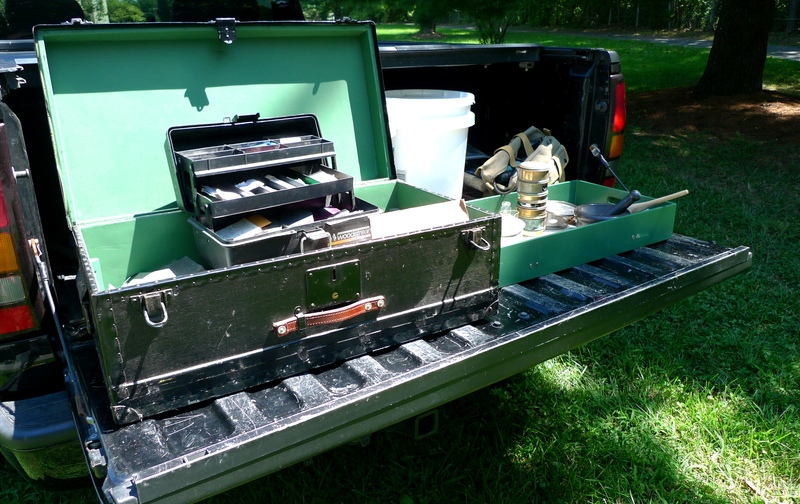 I travel with a small laboratory so that I can do analysis on the go, in this case conducting a mortar analysis on the tailgate of my truck. The important thing to recognize though is that when your goal is to match an historic mortar, the source is local. Taking samples and shipping them off to a laboratory, sometimes many states away, isn’t really the way to success. Looking around you is the key. I first recognized this in the 1990s at Holly Hill in southern Maryland after having a series of experts give me mortar analysis results that couldn’t make a matching mortar. But I realized while walking the property I was seeing washout areas that had the same unique aggregate particles that were in the mortar. 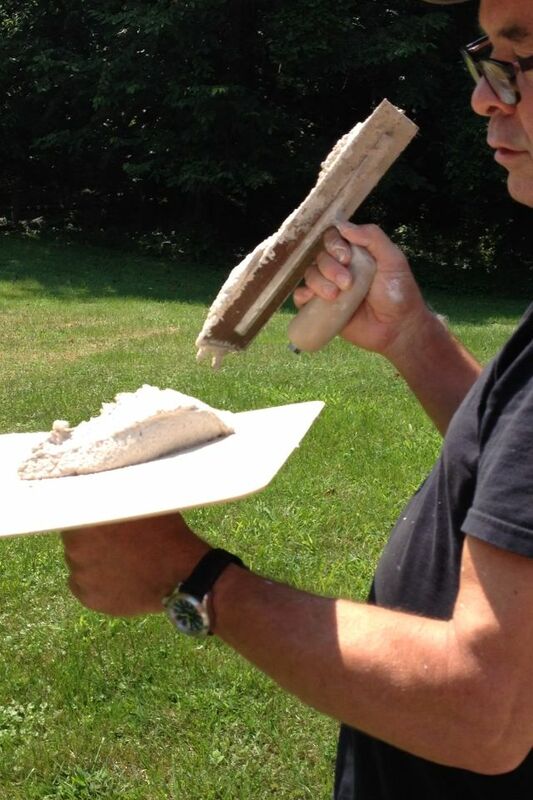 Since then I have always matched mortars on projects East of the Mississippi by finding local sand sources. On some projects this is easier than on others. When people think of local sand, they think of rivers and creeks. 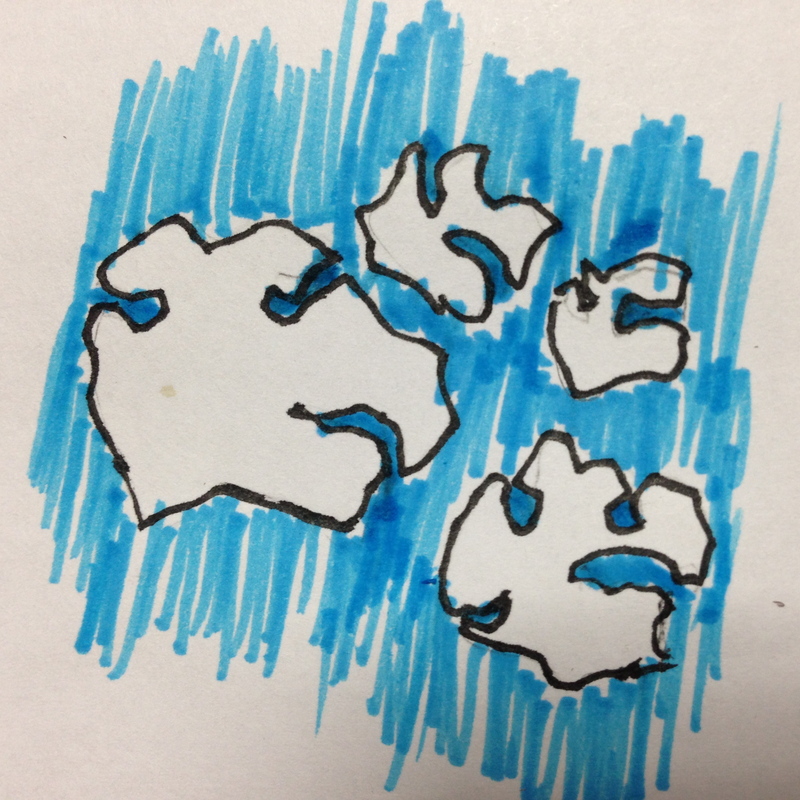 These certainly could have been an early source (and in the case of beaches, one that has shifted over time), but waterways aren’t the only source of sand. 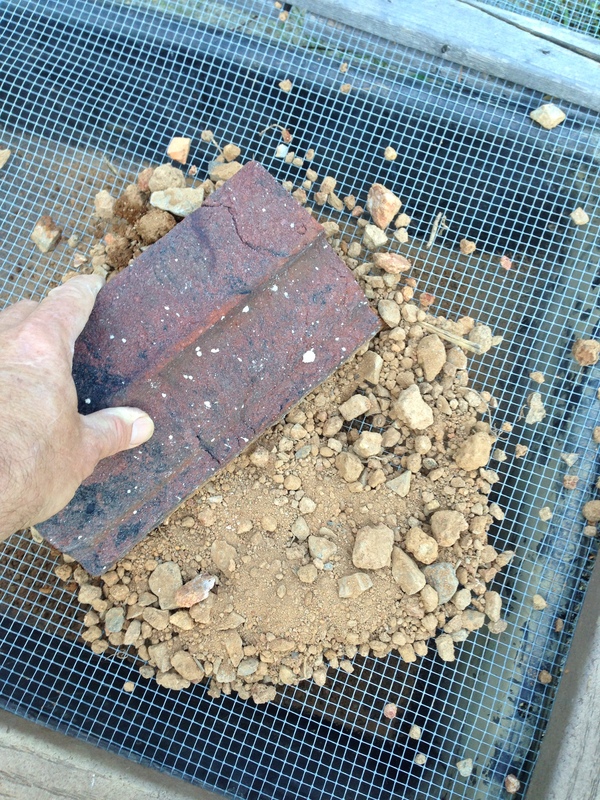 So how do we find a good local aggregate mortar match? I usually start by crushing mortar through sieves like a #8, 16 and 30. This indicates the aggregate range and type. Also I can see if there may be a carbonate component that would disappear during acid digestion. This is often overlooked. 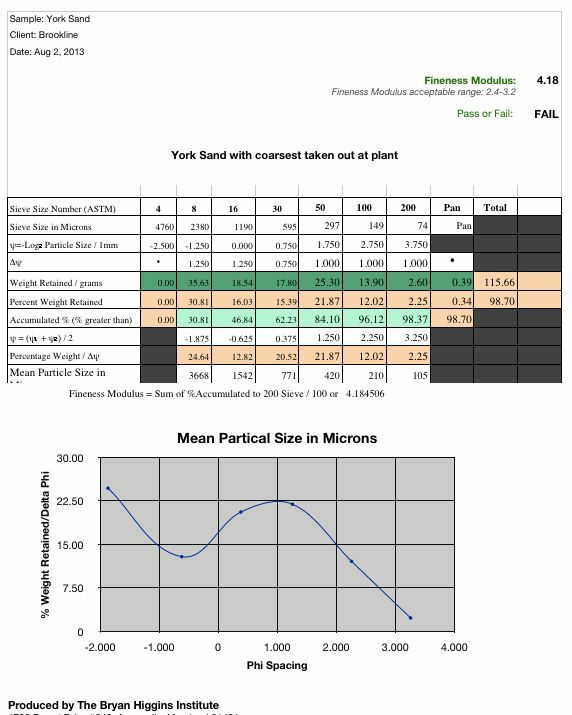 I’ve often heard of people trying to make 1:1 lime:sand mortars because they think that is what the mortar analysis showed … ignoring the fact the geology beneath them is lime-rich. This step of assessing what components of the mortar might be acid-sensitive before starting digestion is crucial. The next step is to take the crushed mortar and put it in a straight-sided vial, add water, shake vigorously, and then set it aside for a few minutes. When an older mason first showed me this, I though “Boy, he hasn’t learned very much.” I was wrong. Bill Forsythe has never been short on great tips and every year I become more aware how much valuable information can be gained this way. The sand, lime, fines, and other materials in the vial stratify. 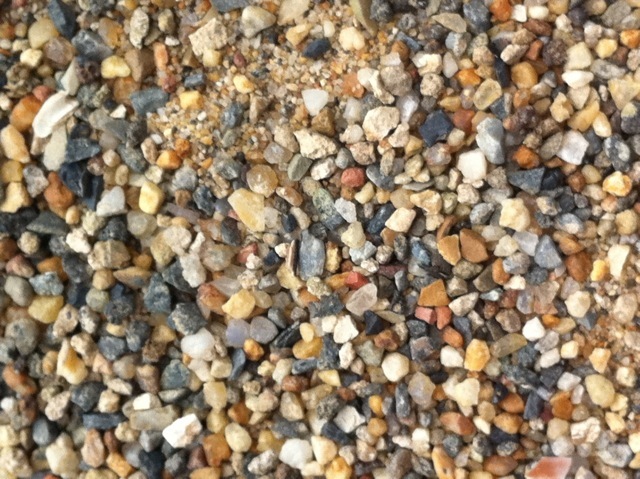 Instantly you can see the general sizes of the aggregate and the amount of silt relative to the sand. Usually there is a distinct band of lime on top which often mirrors the ratio of lime to sand found after digestion. In this case though, there is almost no lime visible. This is because we are using what was largely sand that had washed out of the mortar joints from behind the hard cement parging, where the lime binder had largely been dissolved. 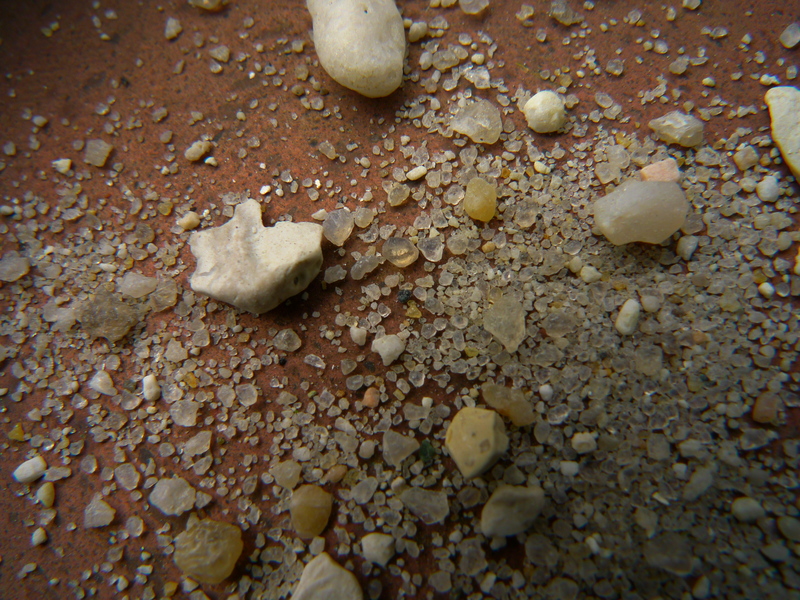 This mortar also has some chunks of unfired limestone showing up in the aggregate. 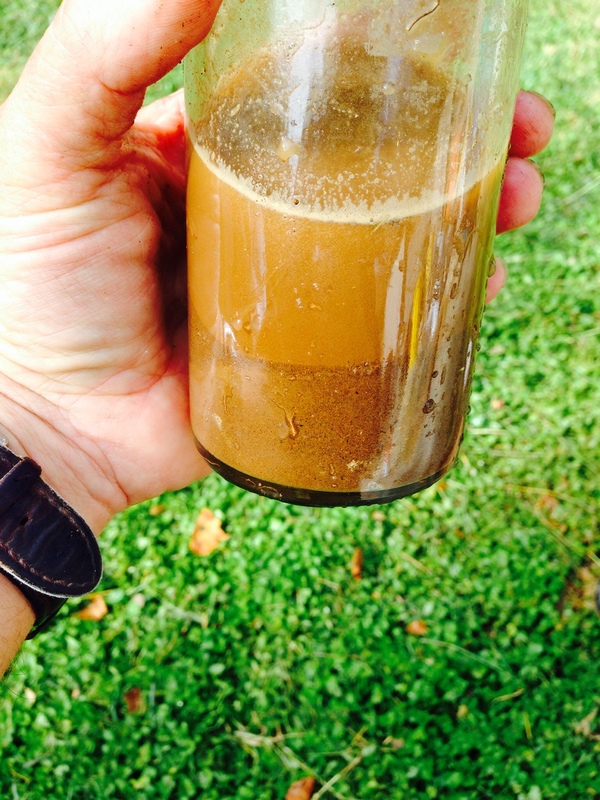 The wet color of the silt (sometimes several silts stratify out) tells you what to look for in the ground. 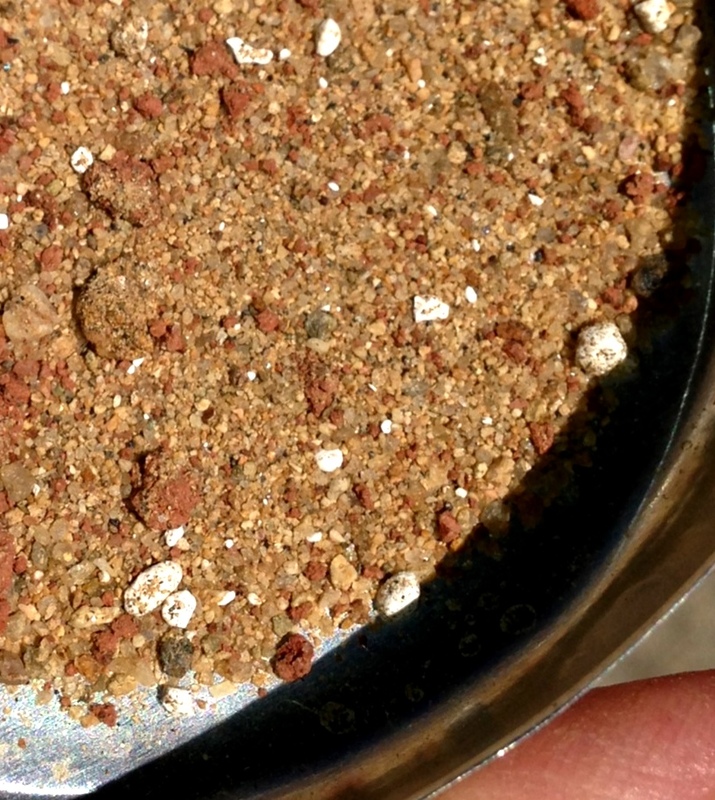 I usually carry both dry and wet samples of crushed mortar when I start looking nearby for the aggregate. 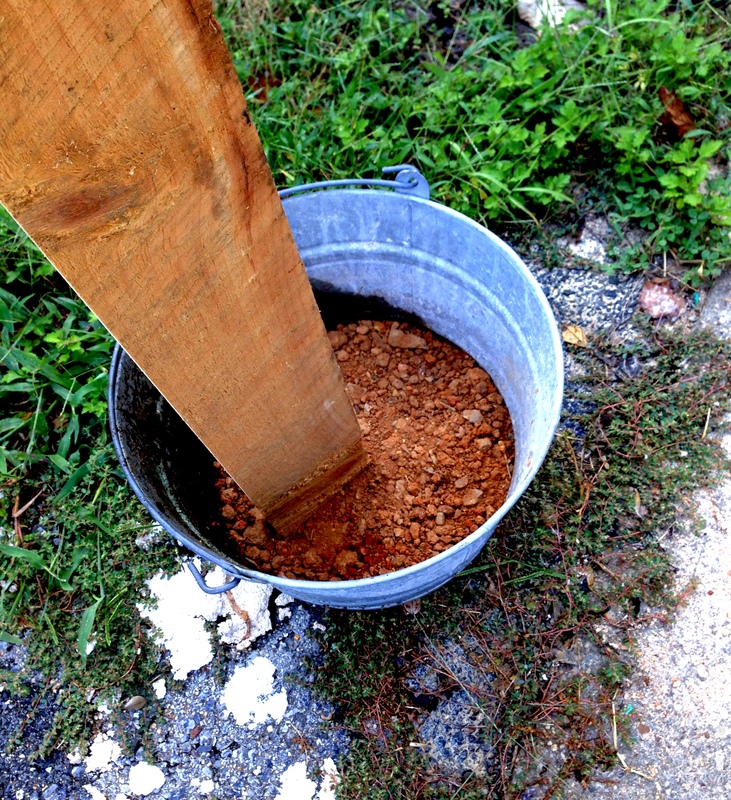 I take another small sample of crushed mortar and pour some vinegar or lime juice over it. These are acidic but not too strong. Even dilute hydrochloric (muriatic) acid will react with iron componds in the aggregate and produce greenish yellow stains that can completely alter what you see. You want to watch the reaction to see if any of the larger aggregate is dissolving. These acids will quickly work on the lime fraction but are slow to dissolve shell or carbonate stone. It’s important to retain these as they are part of the aggregate fraction and definitely affect the mortar’s texture and appearance. Aggregates provide a fingerprint for their locale, highlighting the local geology in miniature. 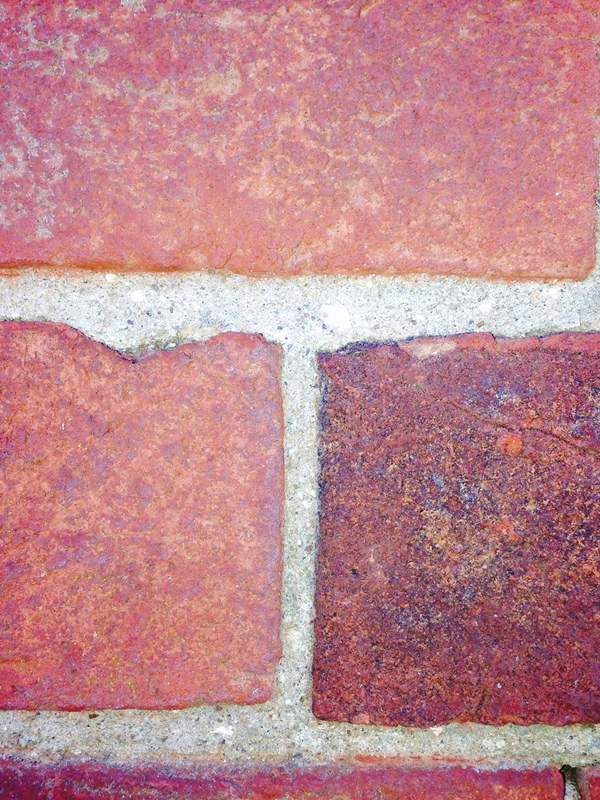 What looked like brick fragments are instead red sandstone. This aggregate is very fine and mostly made up of clear, white, and tan sharp silica, some feldspar, and a few other minerals I don’t recognize yet. But it is not necessary to be able to name all of the minerals in order to match the mortar. The optical comparison is what is important. * Although this already looks like something we would not think of as structural by modern standards, my experience has been that sometimes the finer mixes make incredibly strong mortar, but they definitely shift the lime:sand ratio and you still need to make sure there is a range of particle sizes that can pack together structurally, even if all towards the finer end. ** Although we are talking about mortar at the moment, I cannot stress enough how important getting the aggregates right is to making a matching stucco. Raking light will not cut you any slack if you don’t have the right mix of particle shapes, sizes, packing and silts when patching into an existing stucco. 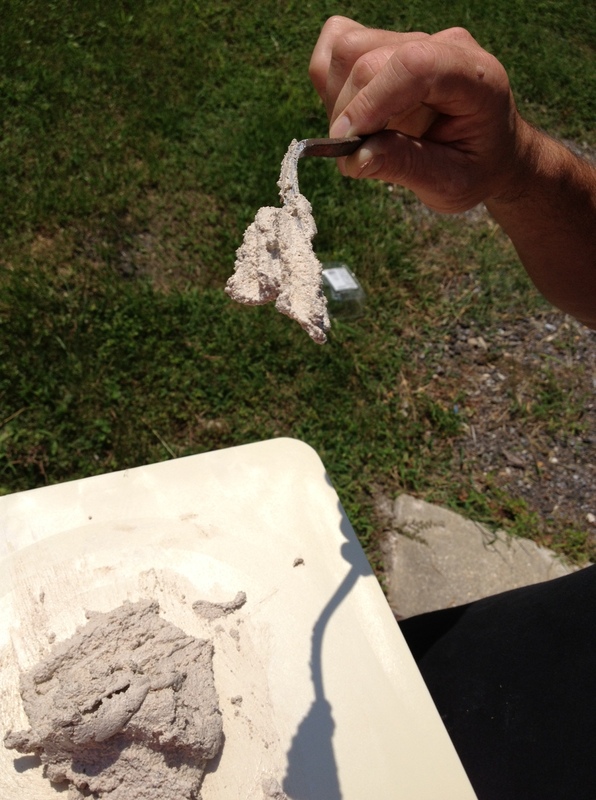 Get the stucco mortar formula match right and seamlessly patching into the existing stucco is within reach. Extra points question: Where does the lime go? What happens to the calcium portion of the calcium carbonate when reacted with acidic compound to release carbon dioxide? Find out here. Considering a local water source that might have provided the builders with a pre-cleaned source, I began with the pond at the bottom of the hill. 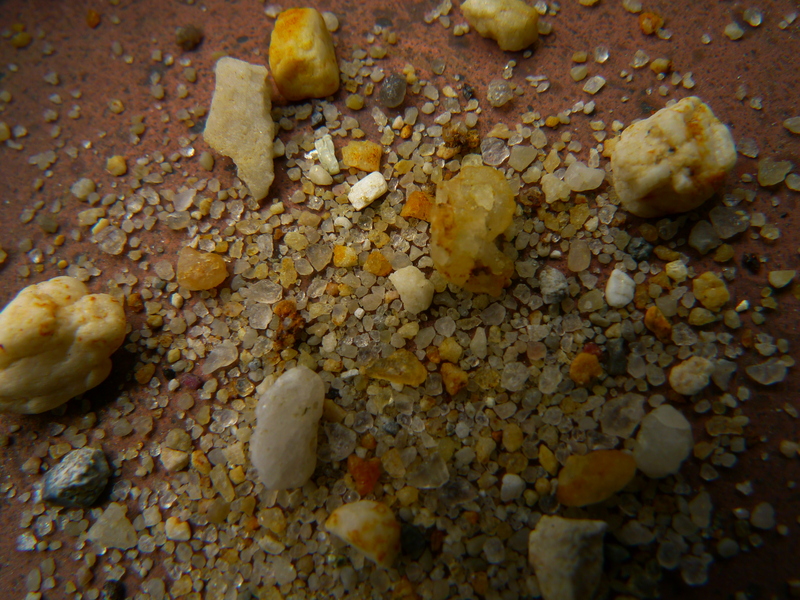 Rinsing sand from the edge and looking at it with my loupe, sure enough, the right minerals and sizes were there. But it was too clean, with no silts and fewer of the red sandstone fragments. To match an original mortar you need the clays and silts for color that are normally stripped out of modern sand sources. Trying to replace them with pigments gives a monolithic color, but not the nuance that silts provide. 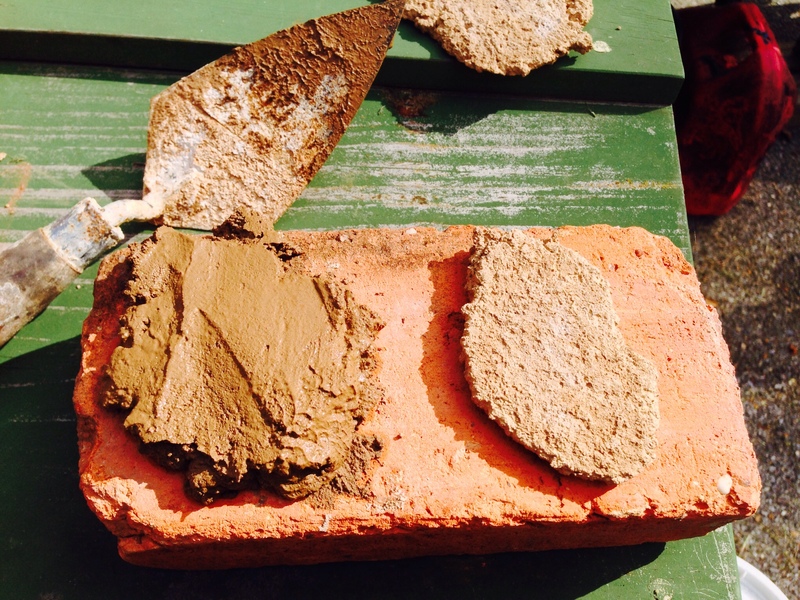 Equally overlooked is how these clays give better working properties. 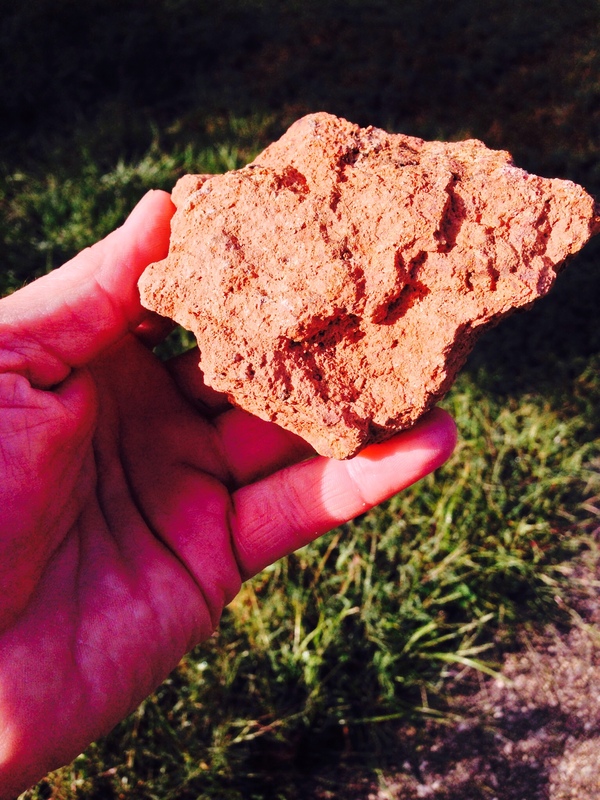 Depending on the local geology, the mortar may have to be aged to stabilize the zeolotic properties of some clays. But, if you want the best working properties, your mortar (with either “clean” or silt-laden fines) should be aged a month before use anyway. If you are planning to cut corners on the aging though, you definitely need to know more about the silt source. 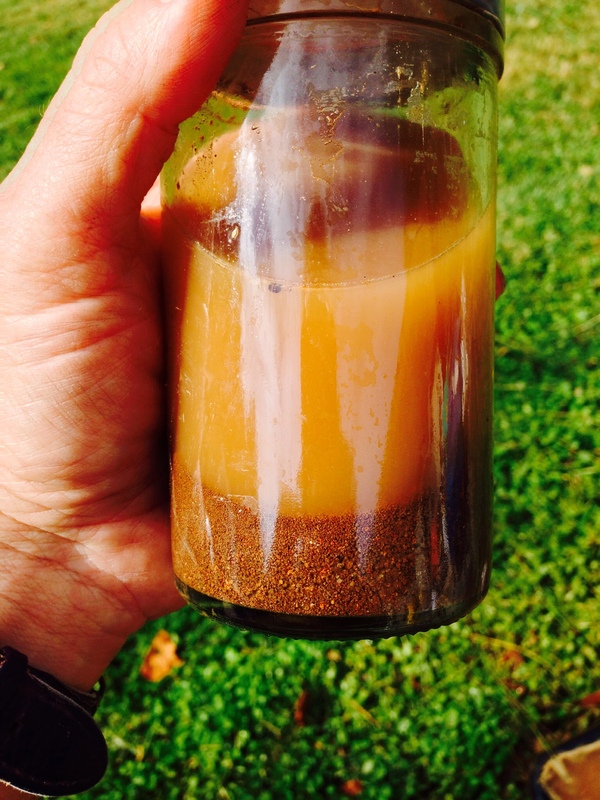 While it is now obvious from the pond sample that my sand is local, how do I find an accessible source? A decade ago, I would have asked a local soil geologist where to look for a particular sand, but I’ve come to learn this is an easy problem to solve. In fact, I remember once finally pinpointing a particular aggregate with the local soil geologist and driving out to the location only to find the steam rollers compressing twenty acres of fresh asphalt in the parking lot of a Food Lion. Normally I would drive around looking for exposed soil that had the right color for my samples. But this time it had started to rain prematurely, so I was preparing to pack it in for the day when I got to wondering if technology couldn’t help me find a source. 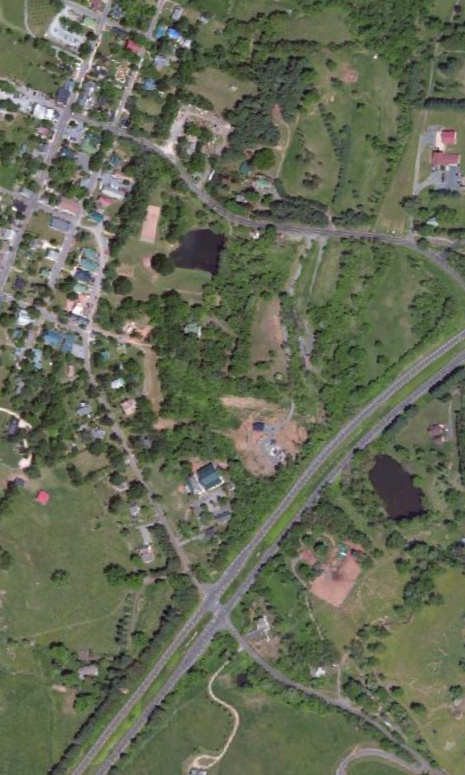 With Google Maps in Satellite View I searched nearby for signs of accessible bare earth. Within a mile I found two construction sites hidden by trees that never would have let me find them just driving down the road. Sampling the soil from one of these pits and comparing it to the aggregate resulting from our mortar showed a good match. The cleaned sand is a bit brighter looking because it was just digested in acid, whereas the sand from the ground is a bit muddier because it has only been rinsed. But clearly the particle distribution and minerals are the same. I hope it is becoming clear that a tremendous amount of analysis can be achieved in field with a relatively basic kit with glassware, a balance, sieves, mortar and pestle, sample bags, a scale, small microscope, pH meter and/or pH paper, various chemicals for testing such as potassium iodide for lead, flashlights, small containers, a 365- and a 405 uv flashlight, masonry take-apart tools, a labeler, note pad, pens, etc. In the 1960’s, while I was working as an apprentice in several trades, I read constantly, mostly non-fiction. It was at this point I became interested in McPhee’s writing with books such as Oranges and the Pine Barrens, which drew me in with his ability to explain intricate technical aspects and cover a vast amount of historical context. By the early 70’s I was reading articles by him in the New Yorker magazine and it may have been one of them that got me interested in geology. In 1981 I read the John McPhee book Basin and Range, which for me was a great introduction to geology. 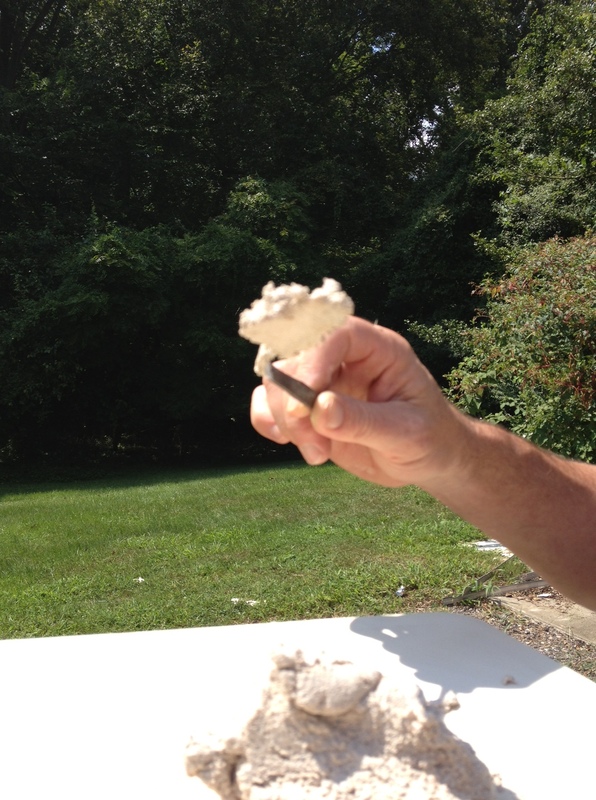 I began my own analysis by crushing up some sound original mortar and sorting out the sand, the shell, and the lime. I wasn’t really getting anywhere until one day when I was out target shooting with the caretaker and saw a sand wash on the side of a hill. I realized immediately I was looking at the source for the sand I was seeking. That was the beginning of my interest in historic masonry materials and practices. And of course, it is so obvious that these buildings have always expressed the natural and geologic history of the area where they were created. I learned that geologists know a great deal about the minerals and stone from which these buildings are constructed. Geologists thus became a constant reference point for me as I learned to understand the deterioration of these materials in the weathering environment. This one project in 1982 opened my eyes, and a big project at Wyck in Philadelphia in 1994 would fully push open the door for what would become a decades-long journey for me to improve upon masonry restoration techniques. 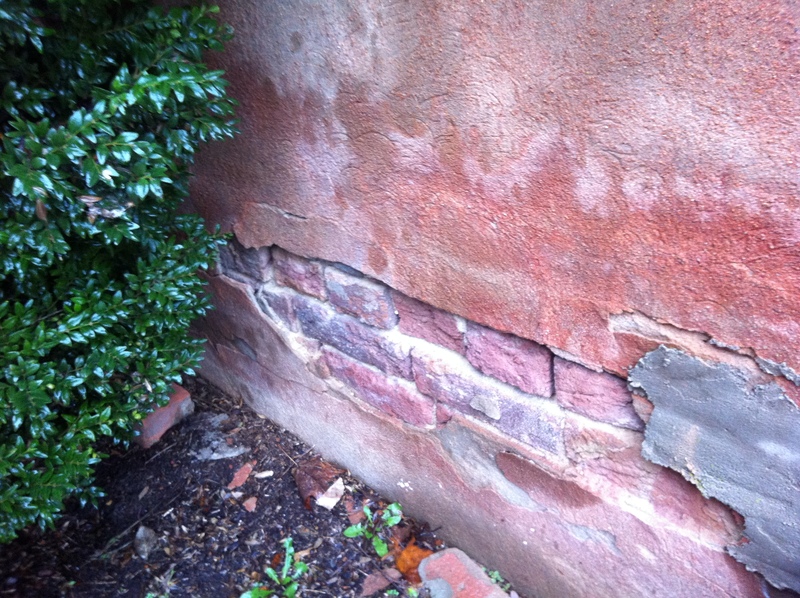 Too often the way historic masonry is treated is embarrassingly inappropriate both in appearance and materials. Doing better work requires understanding the chemistry of lime, the historical methods of making lime materials, as well as learning about the geology of the area surrounding the building in question. By the mid 90’s I was no longer doing much of the wood and finish conservation in which I had spent my first 20 years in conservation. Now almost all my work was with masonry. McPhee’s article in the January 29, 1996 New Yorker magazine titled “The Gravel Page” gave me so much momentum and inspiration – and grounded me with the knowledge that sand really was as distinct as a fingerprint. A graph like the one in the previous post is only one way of understanding your sand. It’s important to look at the aggregate in several ways. Setting the aggregate retained from each fraction out in dishes side by side allows you to see the mineral types and their relationships more easily. After completing a dozen sievings of different sands and relating the graphical display with the actual sand in each bowl you can begin to gauge the quality of sands in the field and predict the likely properties of a mortar or a render made from it even before graphing it. 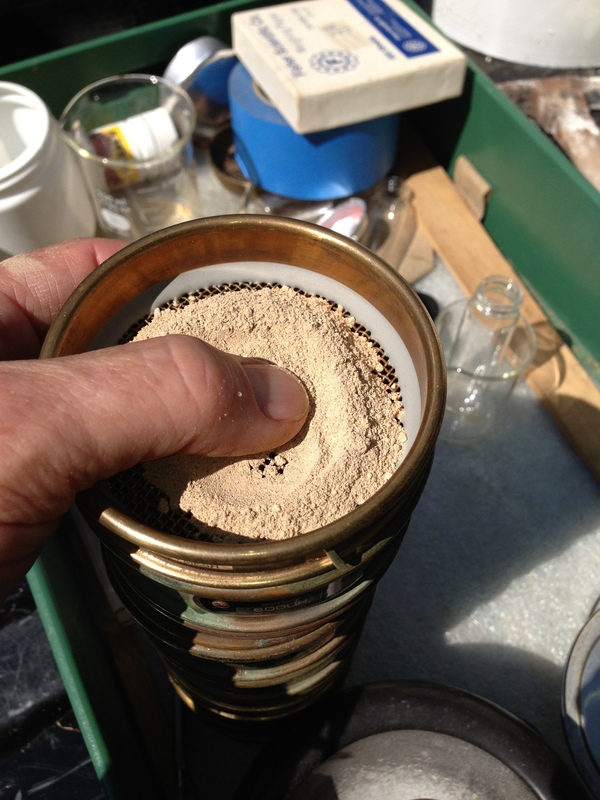 Passing a handful of soil through just three sieves like 8, 16, 50 can immediately give you a sense if a sand is in the ball park. More on this in a future post on matching mortars and renders using locally available materials. 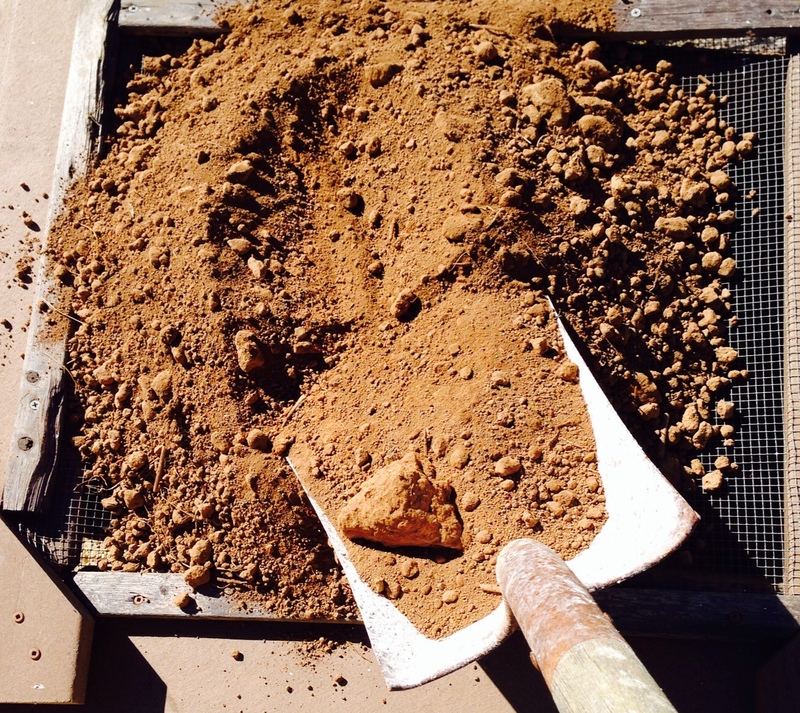 The sieving process will not give you all the information you need to make a good mortar. 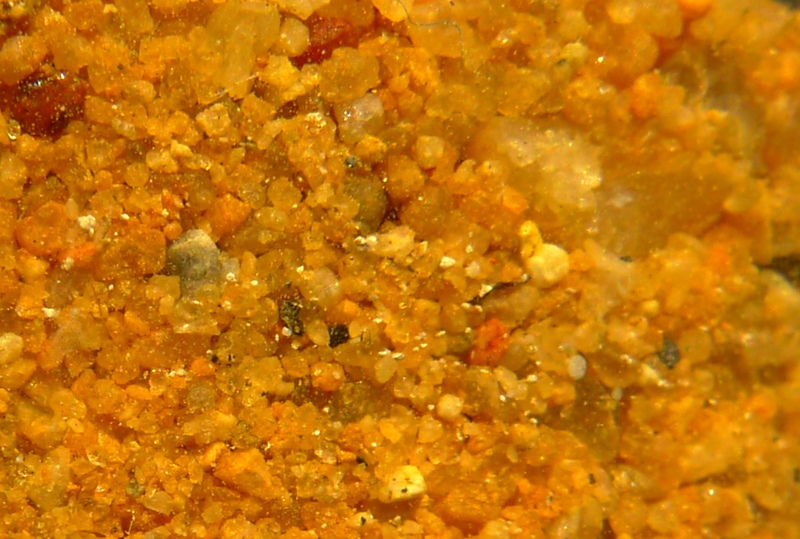 The type of minerals, shape of the sand grains and particle distribution are all important. 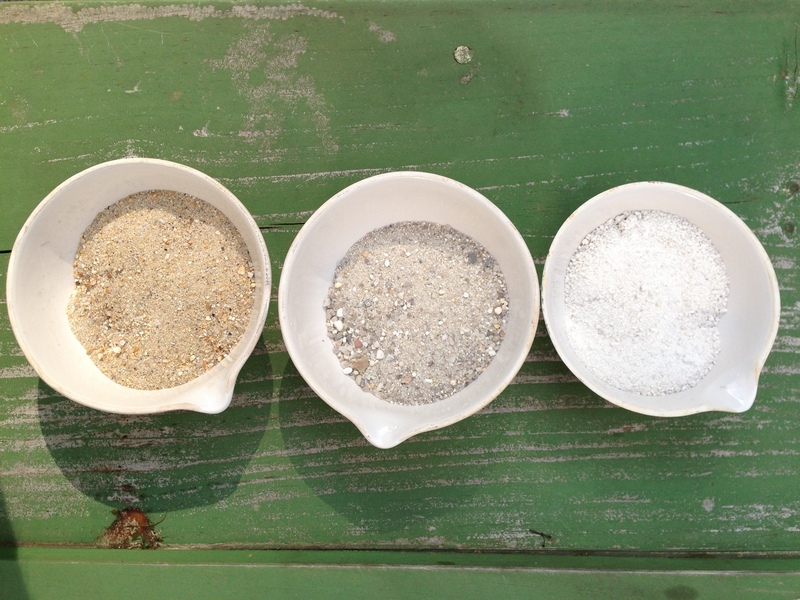 While a skilled mechanic can make almost any aggregate work for most uses on historic buildings, learning how to locate (or make) a better sand will make for better working characteristics and a more durable product. It will also help you in those instances where you are trying to match an historic mortar or render with local materials that may have shifted some over time. Almost anything you read on grading and selecting aggregates is aimed at modern uses and cements where the chemical and physical properties are much more important to get right. There has always been interest in selecting the right aggregates going back in history for thousands of years. This information came largely from empirical observations until the late nineteenth and earliest twentieth century when aggregates were subjected to rigorous scientific investigation. My favorite earlier scientific explanations of aggregates and their impact on mortar strength come from Bryan Higgins in his “Experiments and Observations Made with the View of Improving the Art of Composing and Applying Calcareous Cements and …” which was the result of government interest in relearning how to make durable mortars after buildings constructed following the Great Fire of 1666 in London began failing repeatedly. Yes, humans sometimes have to relearn things over and over. For high performance concrete in buildings or road bed construction the mineral type, particle shape, particle distribution, and void space are all important and carefully engineered. Today’s critical construction activities are focused on factors such as high strength, precise amounts of water and cement, fatigue and frost resistance etc. Although it is not unusual for the aggregate in a historic mortar to graph in a nice curve, the fineness modulus number is related to critical performance rather than matching historic materials. Empirical knowledge has always been vital. For those of us working on historic mortars it is useful to know how all of these factors relate to the choice of aggregate. For instance, in trying to point narrow joints you will need to have aggregate that does not have pieces larger than the joint, but you still want the mortar to be structural (durable). A mostly rounded sand will have different working and strength properties than an angular or sharp sand. 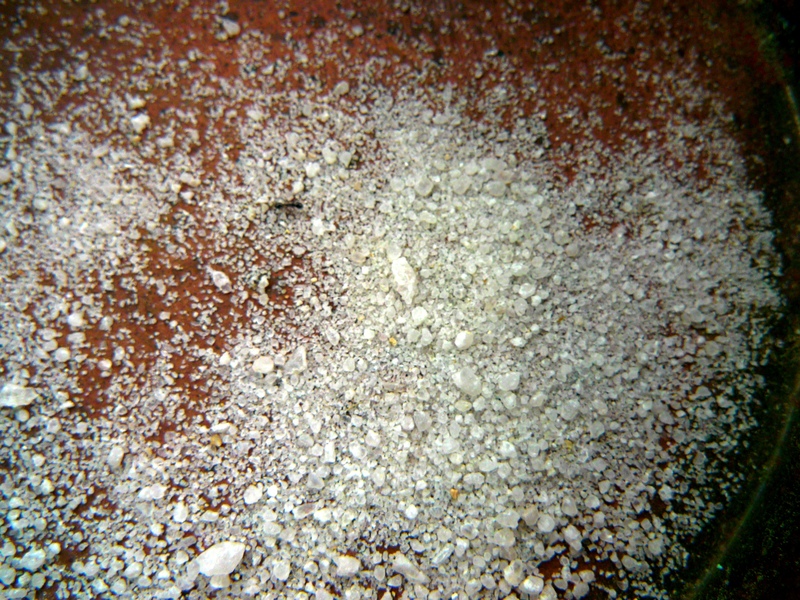 Lack of fines in the aggregate will mean more binder and water needed because of more gaps between the larger particles. 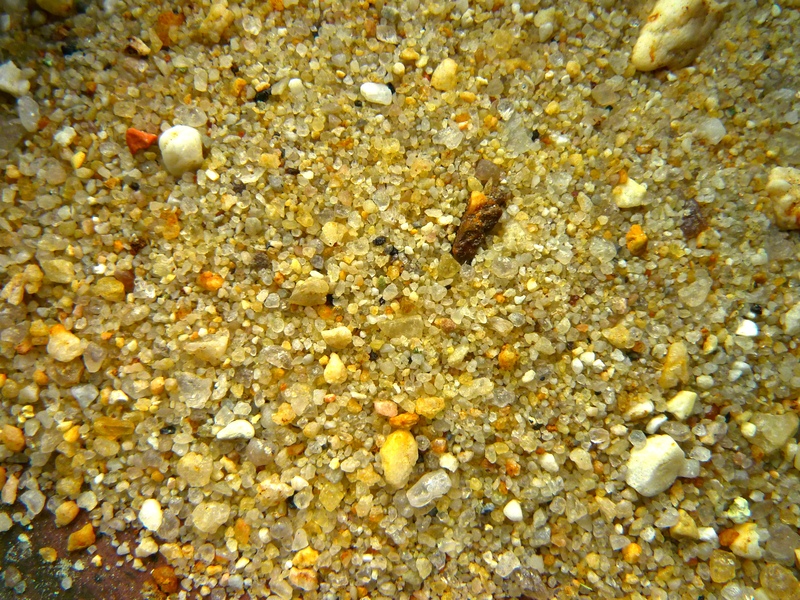 A sand that consists of a narrow range of particle sizes will have a mealy texture and lack cohesion. Addition of some coarser and finer particles will immediately change the working properties. Although you can lay bricks with most any gradation of sand when it come to pointing and plastering, everything has to be just right. And crushed rock is rarely, if ever, a suitable replacement for sand. First, is an example of a graphed sand showing a less than desirable curve (actually a dreaded double peak). How to fix it? Increase the amount of several fractions and reduce another, sieve and graph. Easy and quick to see how to improve the mix. 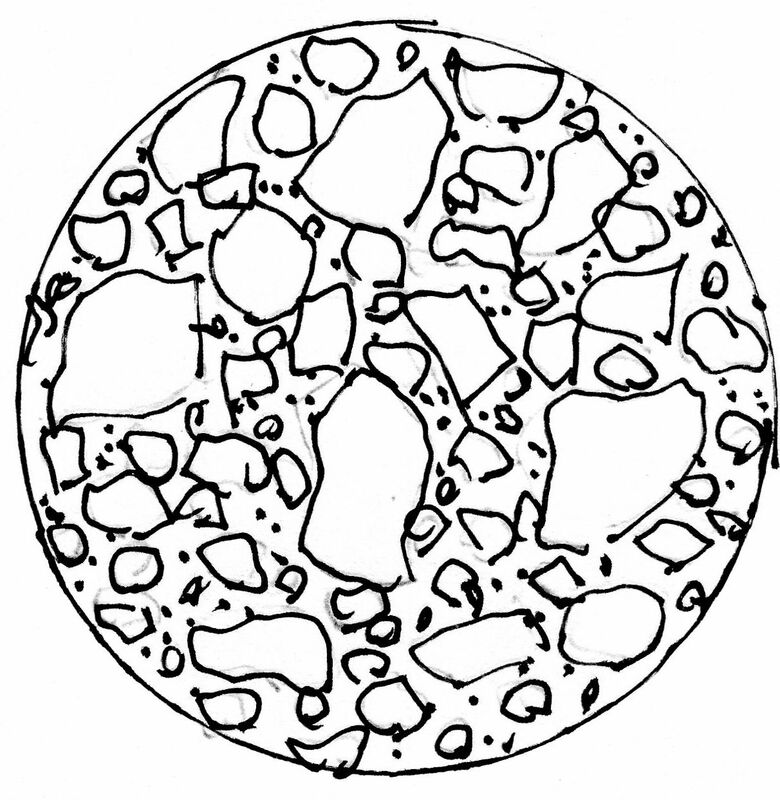 Then – as always –make some mortar and test it to learn empirically how the change in formulation changes the working properties. This way your learning will in time allow you to walk up to a mixer load, dip some out, and instantly tell what may be wrong with it and how to fix it with a few tweaks.